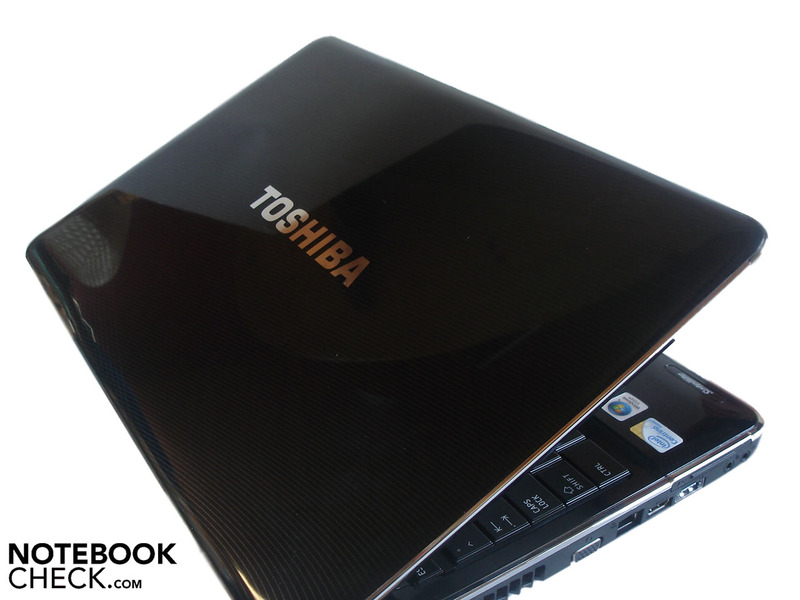 The Toshiba A500-15H is especially aiming at movie fans with its 16 inch HD-display in a cinematic-friendly 16:9 format and its over-sized Harman/Kardon loudspeakers. The A500-15H promises a good gaming performance at the same time, as it's been fitted with an ATI Mobility Radeon HD4650. Read in this comprehensive review if this straddle can be achieved. Currently, four models of the A500 series are especially interesting in the German speaking countries of Europe. The A500-12C begins with 700 Euros as the lowest priced in the range. 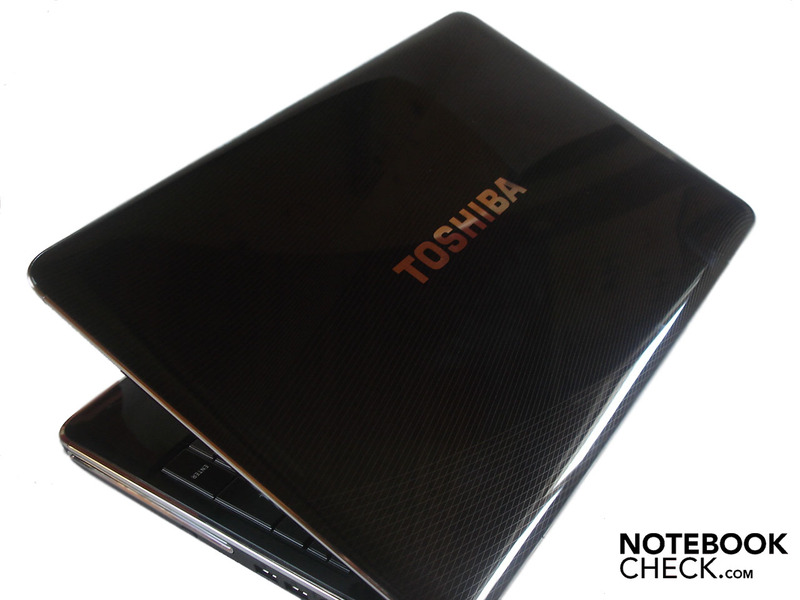 The consumer gets a Core 2 Duo T6500 (2,10 GHz, 2 MByte L2-Cache, 800 MHz FSB), four GByte DDR2-6400 RAM and a hard disk with a capacity of 400 GBytes for this price. 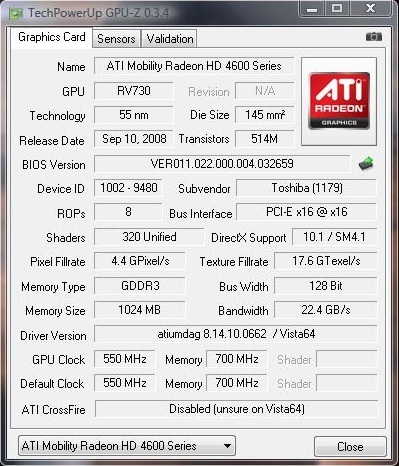 The graphic card of the A500-12C merely restricts itself to the averagely efficient ATI Mobility Radeon HD 4570. For 100 Euros more, you already can obtain the A500-13W. 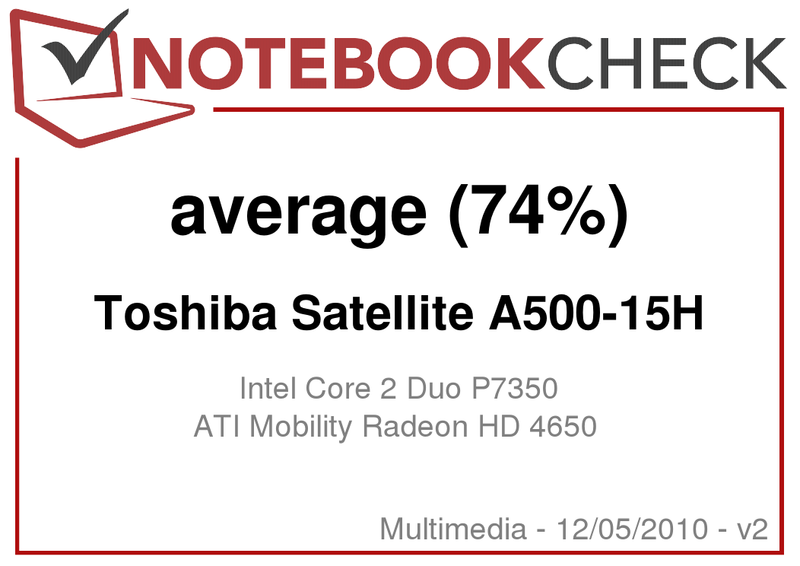 This can show off with the considerably stronger ATI Mobility Radeon HD 4650. Apart from that, there is also a Core 2 Duo P7350 (2,00 GHz, 3 MByte L2-Cache, 1066 MHz FSB), four GByte DDR2 RAM and a 500 GByte sized hard disk integrated. The A500-15H tested by us is sold for a round 1000 Euros. 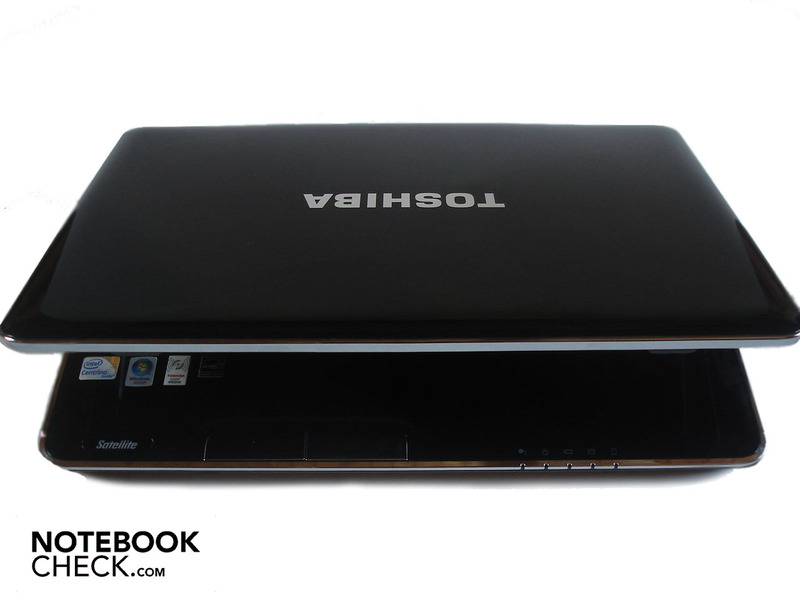 Like the 200 Euros cheaper model, the A500-15H has a Core 2 Duo P7350 and an ATI Mobility Radeon HD 4650. The RAM is, in opposition, much larger with six GBytes, the hard disk capacity is a bit smaller with 400 GBytes. The 1200 Euros expensive A500-14H winds up the range. 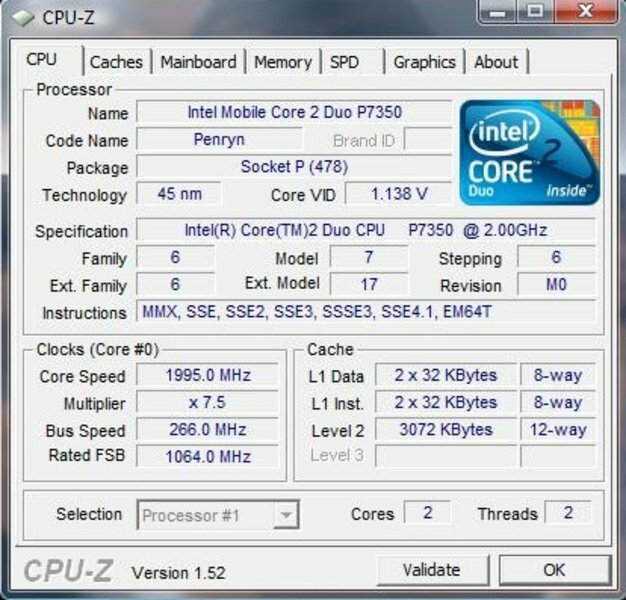 Aside from the ATI Mobility Radeon HD 4650, a strong Core 2 Duo P8700 (2,53 GHz, 3 MByte L2-Cache, 1066 MHz FSB) is employed. The hard disk has a capacity of 500 GBytes, whereas the RAM includes an opulent eight GByte DDR2 RAM. In contrary there are only two pre-built A500 models available in the US. 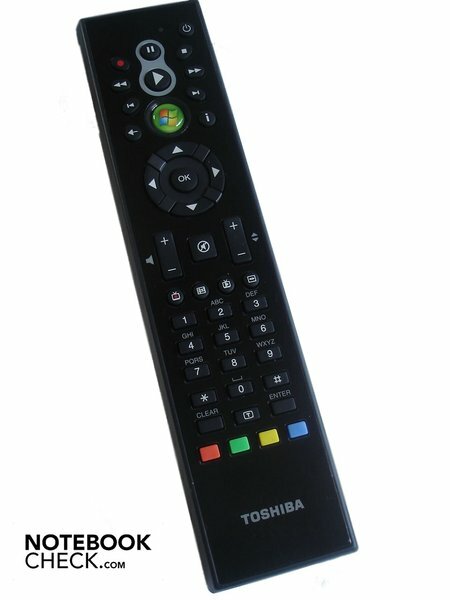 In addition it is possible to built your own A500 at Toshibas website. The low-end model, the A500-ST5601 , costs $ 674.00 at the moment and features alike the German model A500-12C a Core 2 Duo T6500 and four GByte RAM. 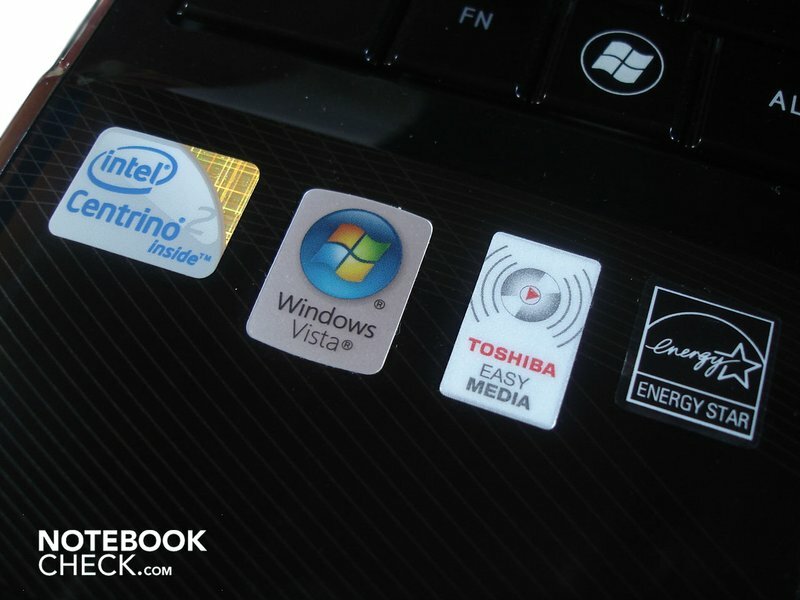 However, only a GMA 4500M HD graphic chip by Intel and a smaller hard drive of 320 GByte capacity are included. The second pre-built model, the A500-ST5602 , which costs $804, conforms to the A500-12C mentioned above. 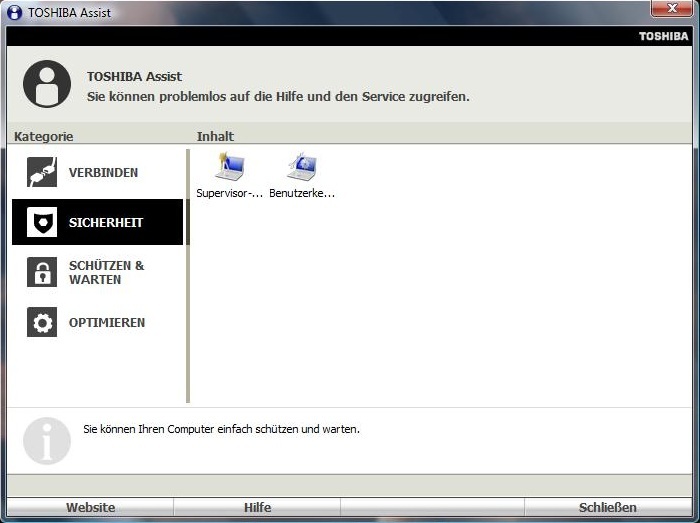 Selecting "Built Your Own" on Toshiba's US-site it not only possible to replicate all models offered in Europe. 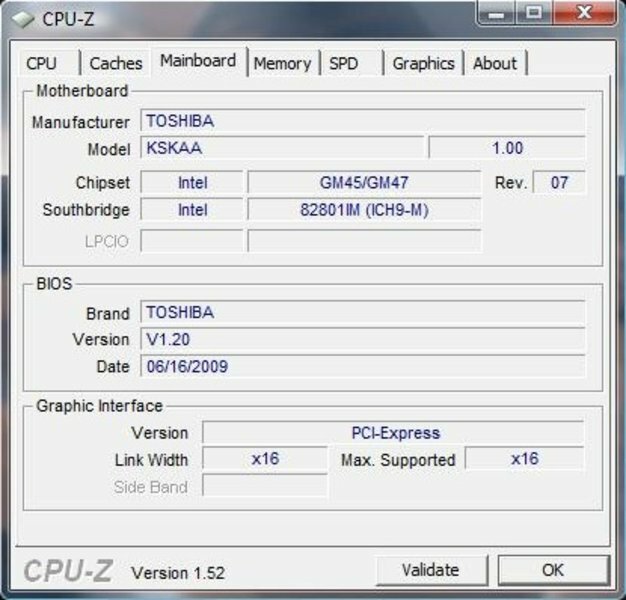 In addition it offers a number of further options regarding CPU (from Pentium T4200 up to Core 2 Duo T9600), RAM (2GB up to 6 GB), and hard disk capacity (250 GB to 500 GB). The low price model here features a Pentium T4200, a GMA 4500M HD, 2 GB RAM, and a 250 GB hard drive at $ 799.00 (without Bluetooth). Hence, you'd better choose one of the pre-built models if you want to go for a low price model. The model in review has to built by your own and would cost about $ 1410.00. 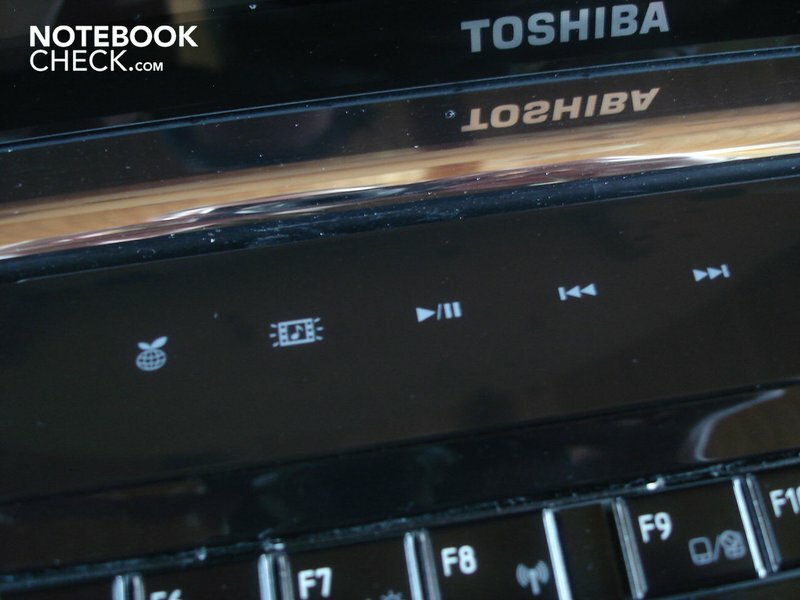 Toshiba has surpassed themselves in the design. Even if the A500-15H's black high-gloss finish attracts fingerprints magically and the surface presents itself as very sensitive to other external influences, with the attractive design, the materials with a high quality appearance, the well accentuated details and the chic texture of fine lucid lines, the A500-15H looks almost precious. The consumer doesn't have to hide behind it at all. With a few exceptions, we couldn't find any sharp edges or uncleanly worked areas. Additionally, the stability can impress almost completely. We could persuade the case to deflecting slightly at most, even under stronger pressure. The display lid equals this also. Hence, there weren't any image distortions to be provoked (with exception of one single small area). Leading to the hinges, which do their job quietly and stably. However, the force needed for opening and closing was a bit too high. We also noticed a very audible click-noise here (in our prototype). These two points can't diminish the otherwise very positive impression. The only thing that really annoyed us was the fact that the case swivels along obviously at opening, despite a proper weight of 3170 grams. Toshiba didn't have to be asked for a manifold of connections and integrated a wide range of options in the A500-15H. As the rear doesn't have any connections, the majority of these are found on the left. 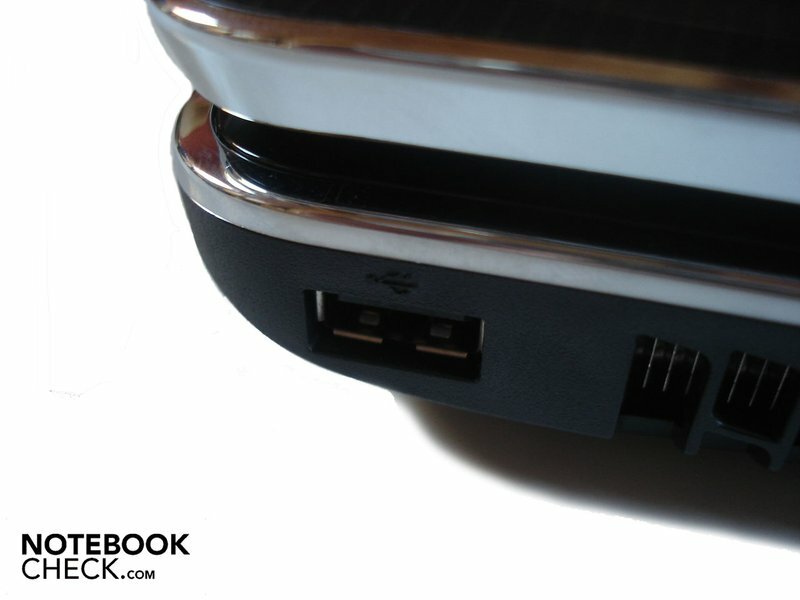 Starting with a lonely USB 2.0 port, beside which the louver is found. This then goes on with a VGA-out, an RJ-45 Gigabit LAN port and an HDMI-out up to an ExpressCard slot, an USB/eSATA combo and two audio sockets (headphone-out, microphone-in). There is a 5-in-1 cardreader on the front, which is proficient of SD, MS, MS PRO, MMC and XD formats. Adjacently, there is an inconspicuous infrared sensor and a slide control for activating and deactivating the integrated WLAN (802.11 a/g/n). The A500-15H also supports Bluetooth, which can only be activated via software or a key combination. 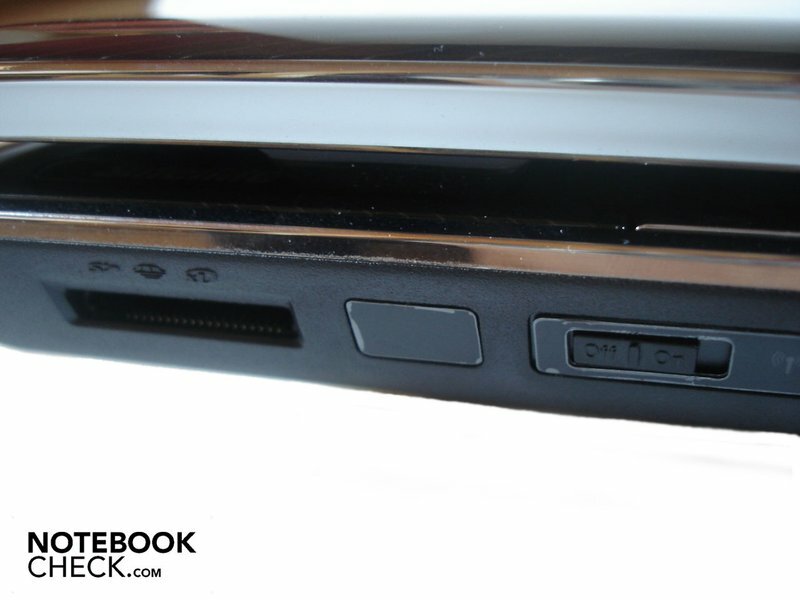 The right has a chic slot-in DVD burner, two USB 2.0 ports and a rather rare antenna socket. The power socket and a Kensington lock complete the array. At least on the left, we didn't really like the port distribution because most ports have been placed fairly far front and the according cables could get in the way very fast. The highlight is, however, the included remote control. Unfortunately, its characteristics couldn't impress us very much. The remote control is, in opposition to its partly minute keys, disagreeably huge. Aside from that, it has an awkward feeling and the keys have an awful pressure point. The verdict of the software configuration turns out divided. 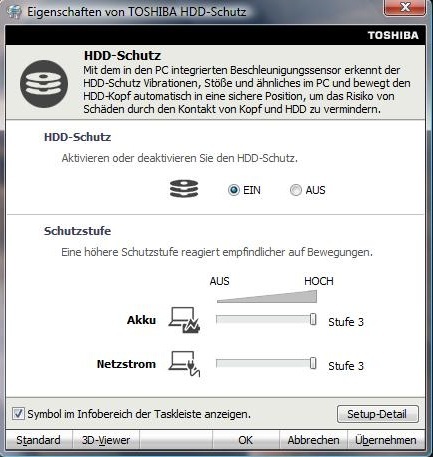 On the one side, Toshiba has installed very interesting and handy programs (which mostly bid tuned-up Windows functions). On the other side, there are very many unnecessary and resource devouring tools included. Because Toshiba has also preinstalled an incredible amount of programs (over 20 tools and 20 games), the system velocity is rather an impertinence in its state of delivery. The system start takes painstakingly long and when Windows has finally booted, the system lags tremendously. In return, cleaning the system and leaving only the most important tools on the hard disk increases the work velocity obviously. But, enough critique because as already said, some programs are really interesting. The A500-15H supports a shock-protection for hard disks, which can be set in three stages via special software. 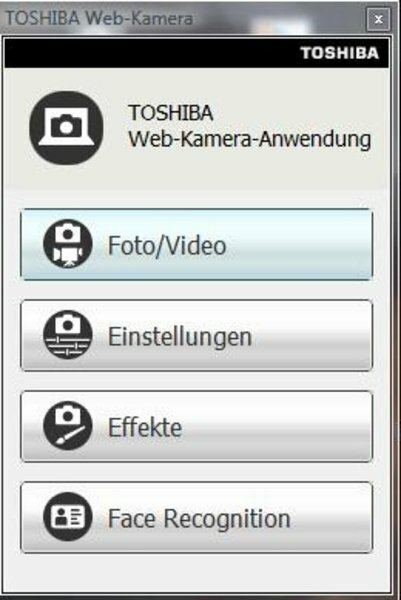 Aside from this, it's possible to control various security and maintenance features with the "Toshiba Assist" tool on a refined surface. Among other things, it's possible to change the supervisor or user password. To save energy, the A500-15H additionally has a USB sleep and charge function that can be customized to the individual needs in various modes. 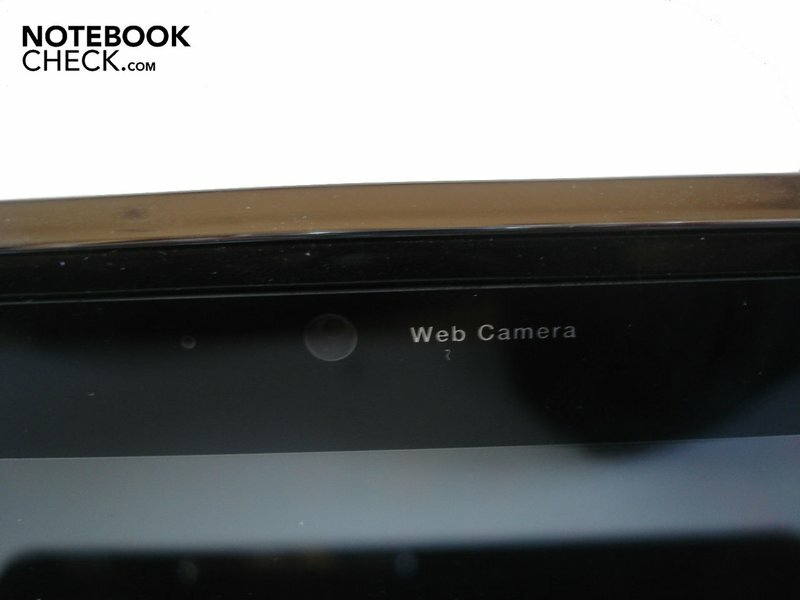 The webcam application boots at system start and settles down inconspicuously on the left desktop edge. The integrated face recognition can also be controlled over this. 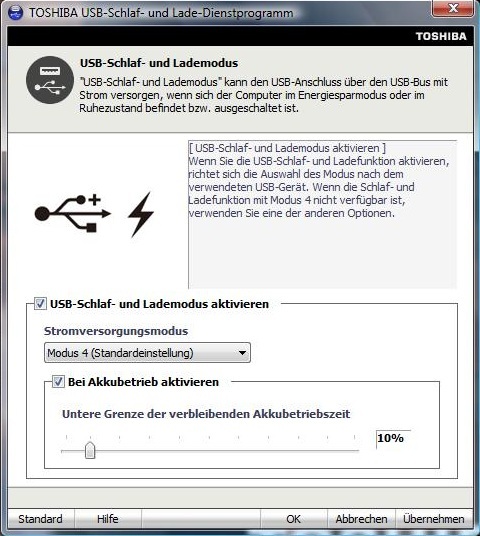 Toshiba's "Eco Utility" gives a good overview of the momentary power consumption and the set energy savings functions. 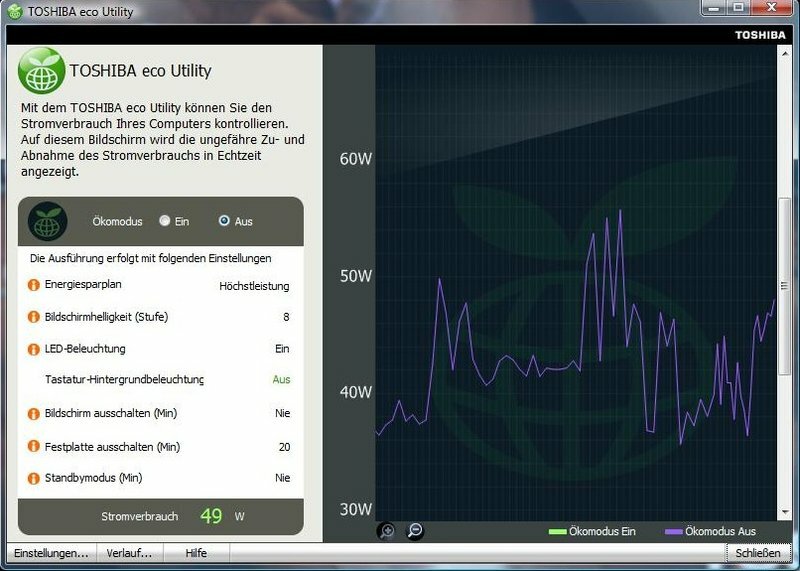 The "Eco Mode" can be triggered with it and a chart shows the power consumption in watt. Finally, the user receives an overview of the available wireless networks in his surrounding with support of an optically pleasing implemented "Radar". In following we have made a few screenshots of the single features. The keyboard, like the rest of the case, has been kept in black high-gloss, but surprisingly isn't as susceptible to filth as you might think at first sight. 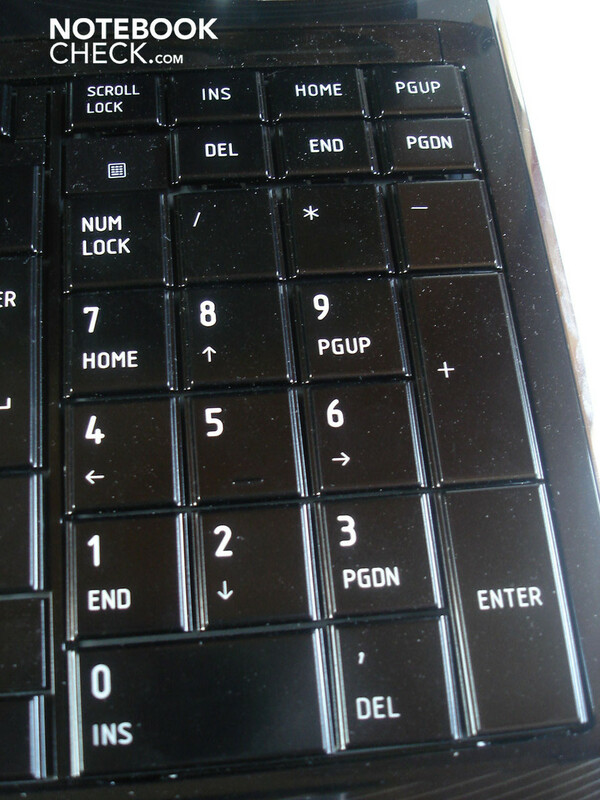 The partly obvious keyboard bending isn't noticeable at first, but becomes even more annoying in the run of course. Particularly the center deflects considerably already at low pressure. The fact that the keys have a fairly good pressure point at least extenuates this circumstance. 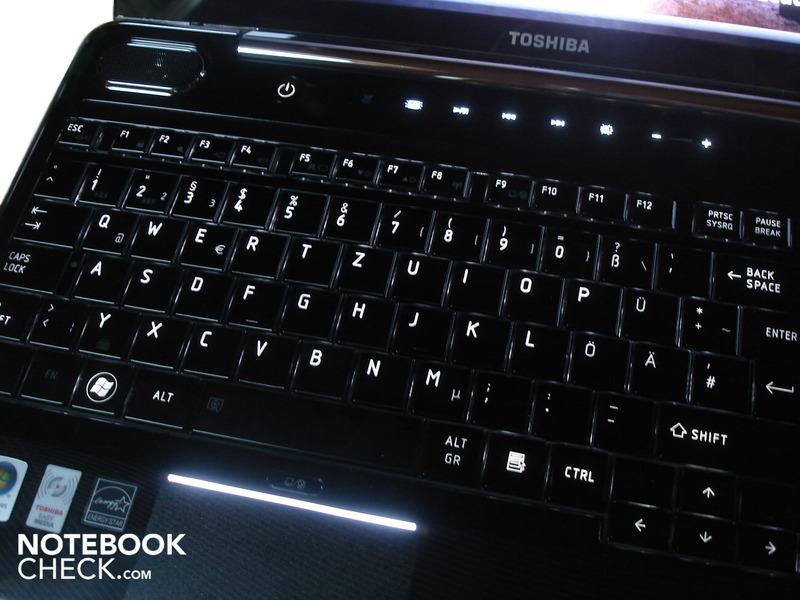 As to the layout and key size, Toshiba hasn't made any blunders, except for the arrow keys that have turned out too small. A special highlight is the white keyboard light (which is rather rare in this price category). This is intelligently only on at use and can be completely deactivate when it's not required. Now we come to the touchpad, which has been placed too far left for our taste and is, therefore, triggered unintentionally especially at gaming. 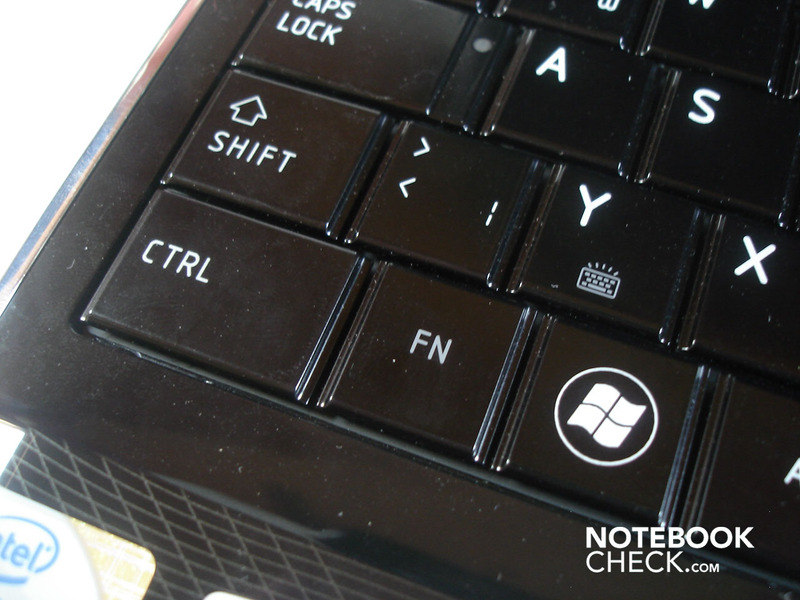 This critique point isn't of a major consequence because the touchpad can be deactivated over an according key. 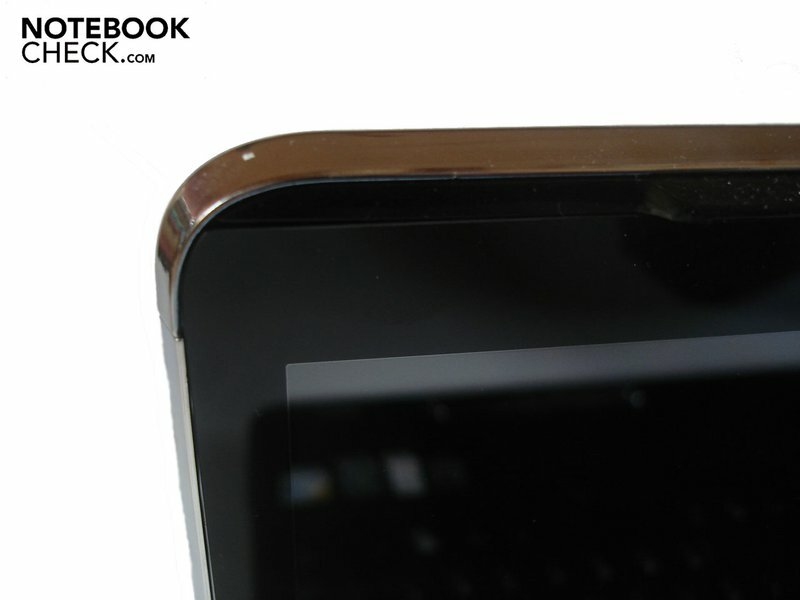 The touchpad barely discriminates itself from the surrounding palm rests, however has a slightly roughened surface. This represents the perfect compromise of gliding ability and necessary feedback. 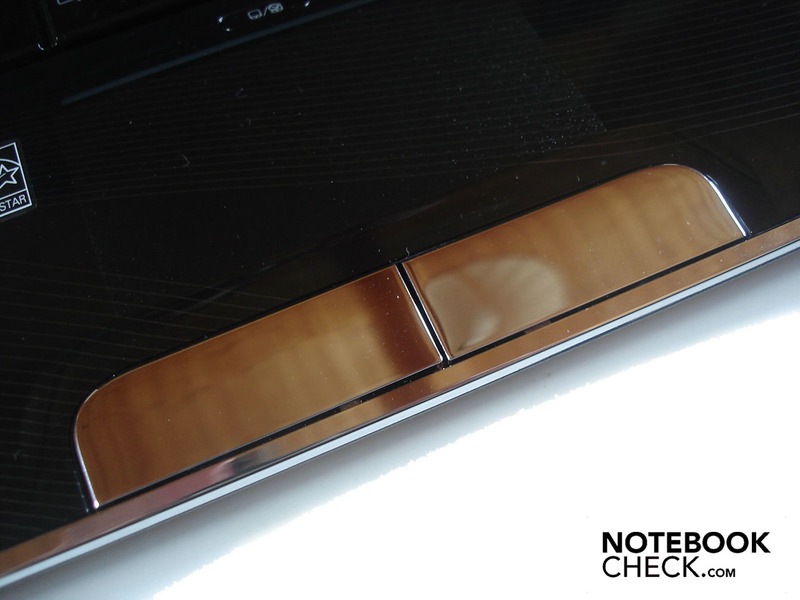 In our opinion, the touchpad has regrettably turned out too narrow vertically so that it lacks a bit of room for maneuvering. 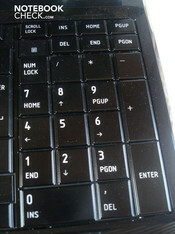 Both large touchpad keys shine silvery and are, therefore, susceptible for smudge. The pressure point is good in the middle but in return too hard outwards and too soft inwards. Smaller keys with a consistent pressure point would have probably been the better choice here. 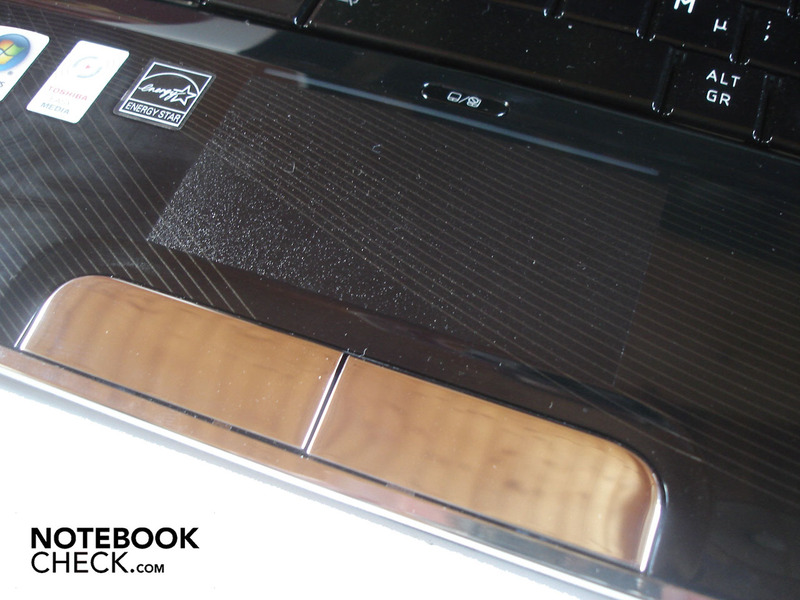 Like almost every currently available multimedia notebook, the A500-15H has a touch sensitive bar above the keyboard. Typical multimedia functions such as volume control can be controlled with these. They additionally have buttons for the mentioned "Eco-Mode" and for deactivating all lights. The touchscreen bar's triggering behavior could barely convince us. A (too) long and strong pressure is needed to activate a function. 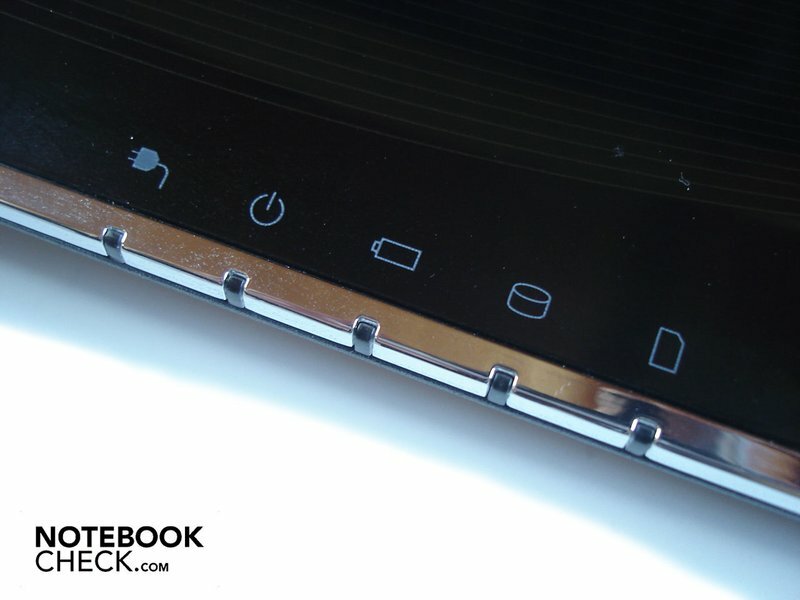 Additionally, the A500-15H rewards the use of the touchscreen functions with a very irritating beep. Because of this, we ignored the bar by and by. 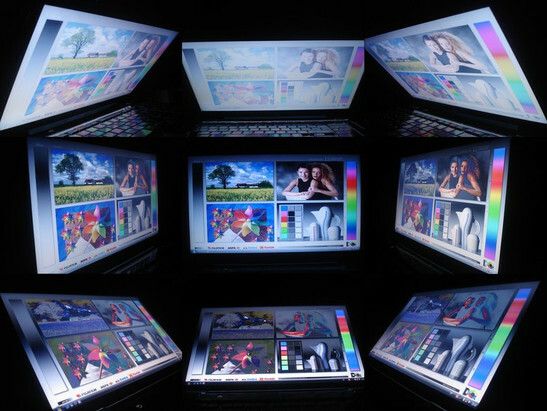 The 16.0 inch display in a 16:9 format has an HD resolution of 1366x768 pixels and is thus perfectly implemented for the needs of movie fans. In return, the intrinsic values are mostly disappointing. While the luminosity with an average of 205.3 cd/m2 and the illumination of 75% is still okay, the black value of 1.61 cd/m2 is considerably too high and the according contrast of 148:1 too low. Subjectively, the image appeared to be quite pallid, colorless and too grayish in dark surroundings. The allotment is simply too trivial, especially for a multimedia notebook. At least the brightness stays consistent and doesn't lessen in battery mode. 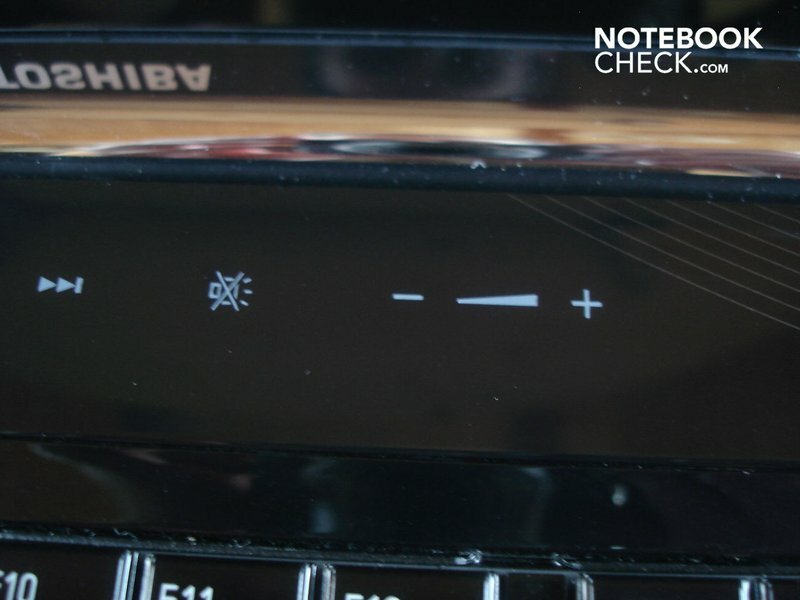 Due to the employed reflective screen, it's barely surprising that the A500-15H isn't very suitable for outdoor use. It's even difficult to recognize anything on the screen in the shade and eyes are strained quickly. It can even come to reflections indoors at adverse light conditions, which could particularly limit movie enjoyment considerably. 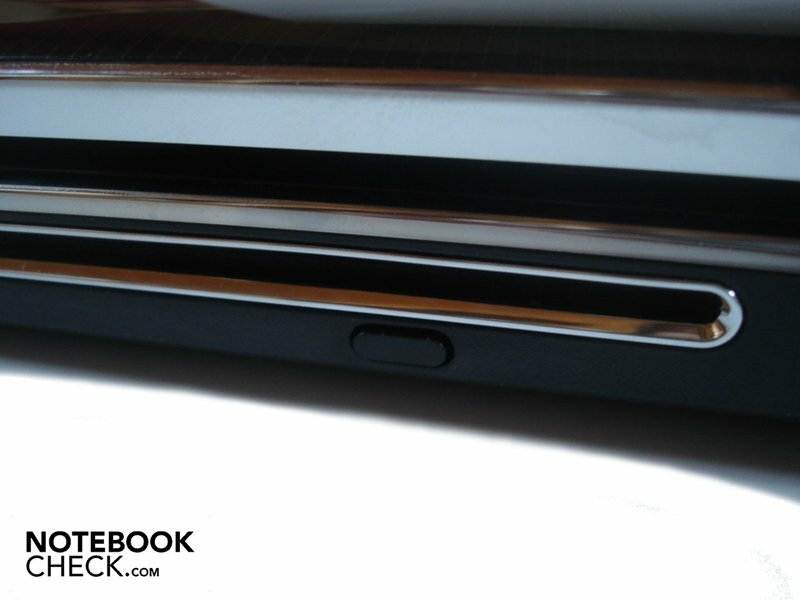 Also, the viewing angles are rather mediocre horizontally as well as vertically. Thus, color irregularities and brightness deviations can creep in quickly at wide angles. 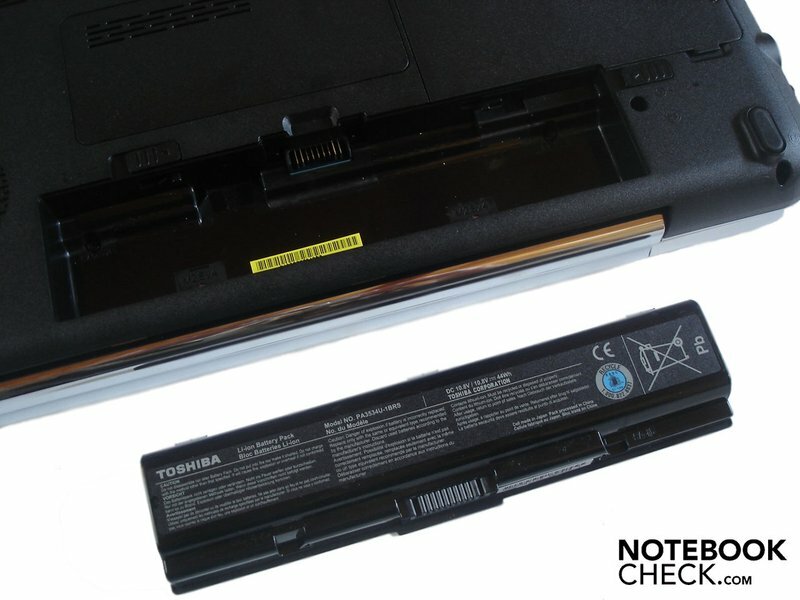 Toshiba has used a balanced mixture of mid-range products for the components. 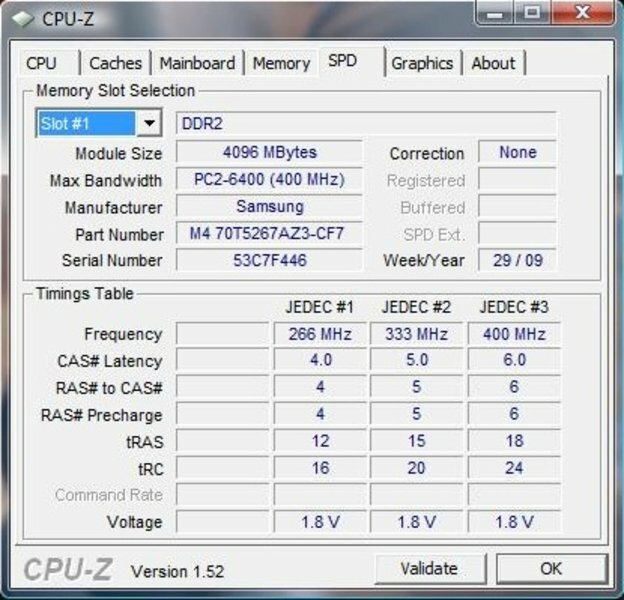 A Core 2 Duo P7350 with 2.00 GHz (3 MByte L2-Cache, 1066 MHz FSB) is used as a CPU. This is supported by an opulent six GByte DDR2 6400 RAM with 800 MHz. 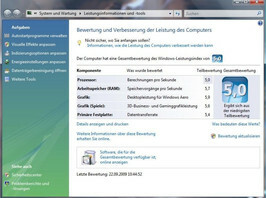 As Windows Vista Home Premium in both the 32bit and the 64bit version has been included, the entire bandwidth is available. 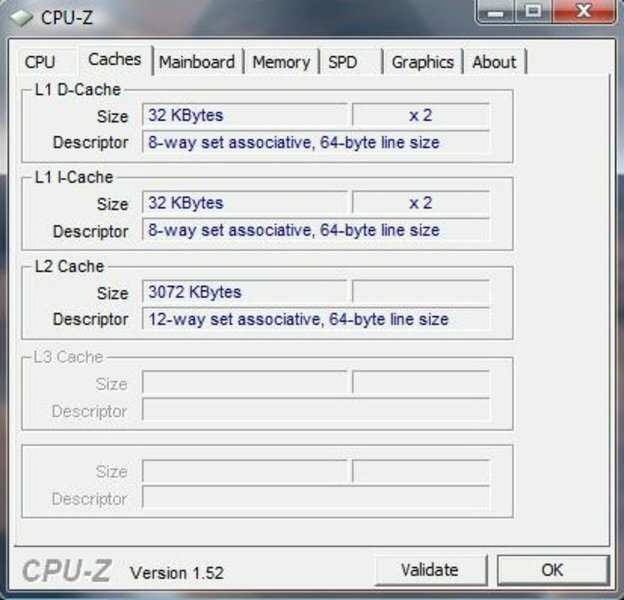 A maximum of up to eight GBytes can be implemented on the main board. 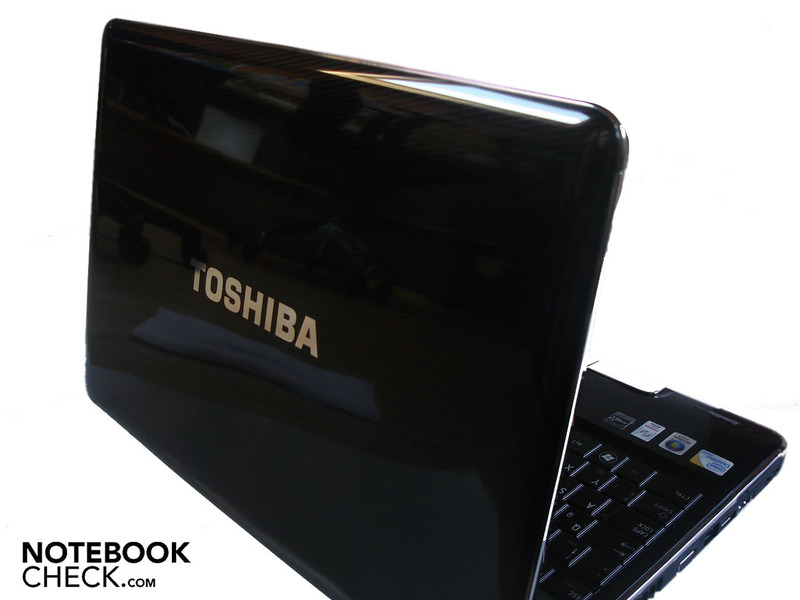 Toshiba has chosen the well-positioned, in view of money for value, ATI Mobility Radeon HD 4650 with one GByte DDR3 VRAM for the graphic card. The HD 4650, manufactured in a 55nm lithography process, has a clock rate of 550 MHz (core) and 700 MHz (memory) and has 320 so-called stream processors. Due to the UVD 2 (Unified Video Decoder) technology, the HD 4650 supports the CPU at computing of high resolution video materials. 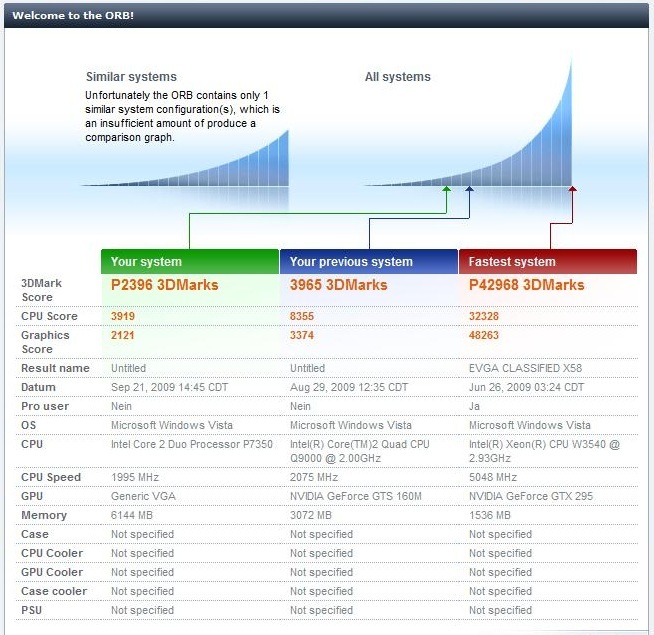 The HD 4650 places itself between the almost equal GeForce GT 240M (for example in the Acer 5739G) and the expensive GeForce GTS 160M (for example in the MSI GT628), in view of efficiency. Let's now look at our comprehensive benchmark course, which we'll start with the CPU-biased benchmarks. The A500-15H achieved 2413 points in single-core and 4633 points in multi-core rendering of Cinebench R10. 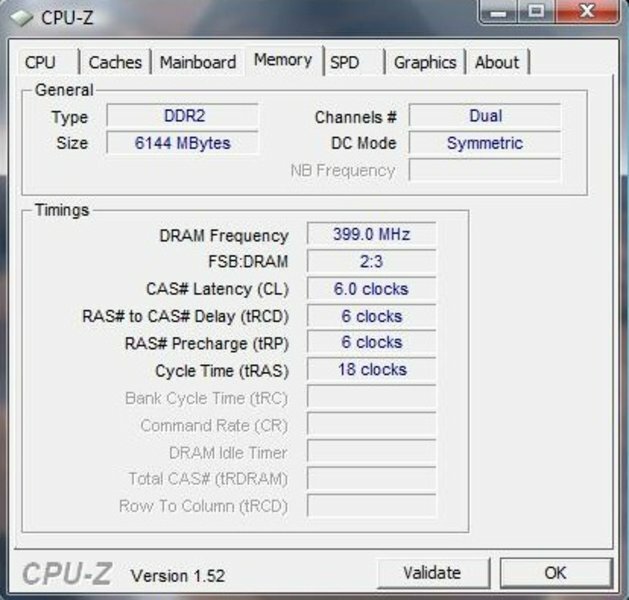 In comparison, the Core 2 Quad Q9000 can be named: It has the same clock rate with 2.00 GHz but has a six instead of "only" three MByte L2 cache. A Q9000 is barely any faster with 2468 points in the single-core and, as expected, twice as fast with 7893 points in multi-core rendering. 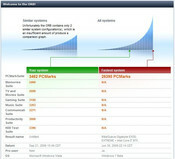 The A500-15H scored a good 5833 points in PCMark05 and a decent 3462 points in PCMarkVantage. 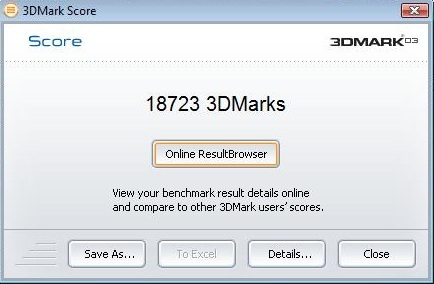 We rely especially on the established Futuremark 3DMark for the GPU-prone benchmarks. 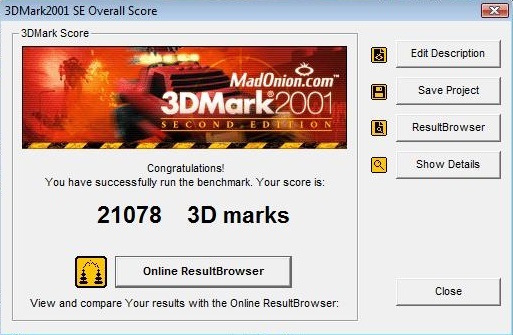 The Radeon HD 4650 reached a good 11220 points in 3DMark05 and it was enough for 5713 points in 3DMark06, whereas "merely" 2396 points were still possible in 3DMarkVantage. 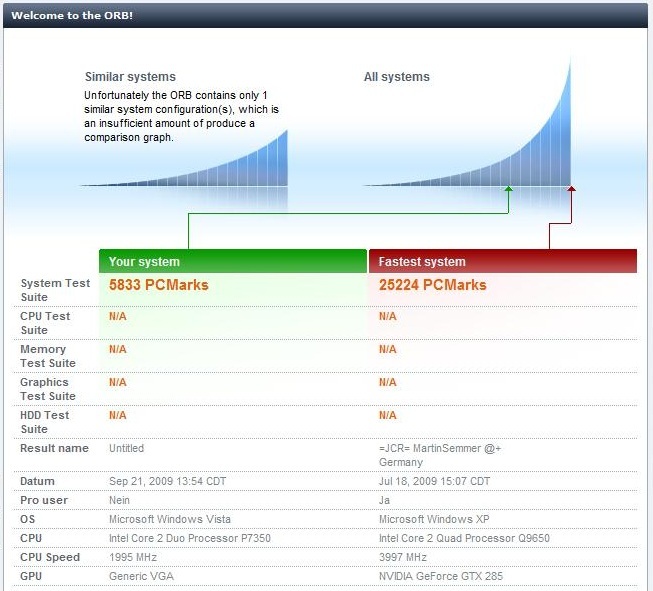 A GeForce GT 240M is about as fast with 11419 points (3DMark05), 5857 points (3DMark06) and 2348 points (3DMarkVantage). 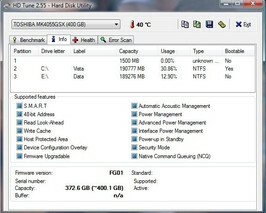 A hard disk with a capacity of 400 GBytes and 5400 rpm is used as the mass memory. 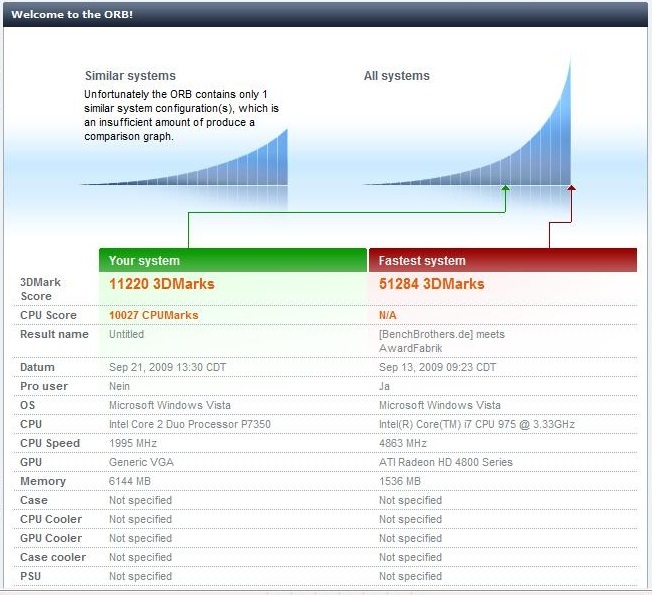 We assessed its results with the HDTune tool. Whilst the throughput rate of 115.5 MB/s is still acceptable, the other results turn out rather disappointing. 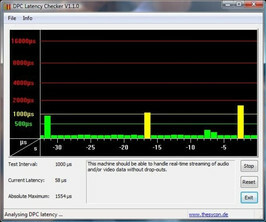 Hence, the access rate is a high 18.8 ms, the transfer rate remains to be meager with an average of 39.8 MB/s. Toshiba has divided the hard disk into two almost equally large partitions with about 186 GBytes each ex-factory. 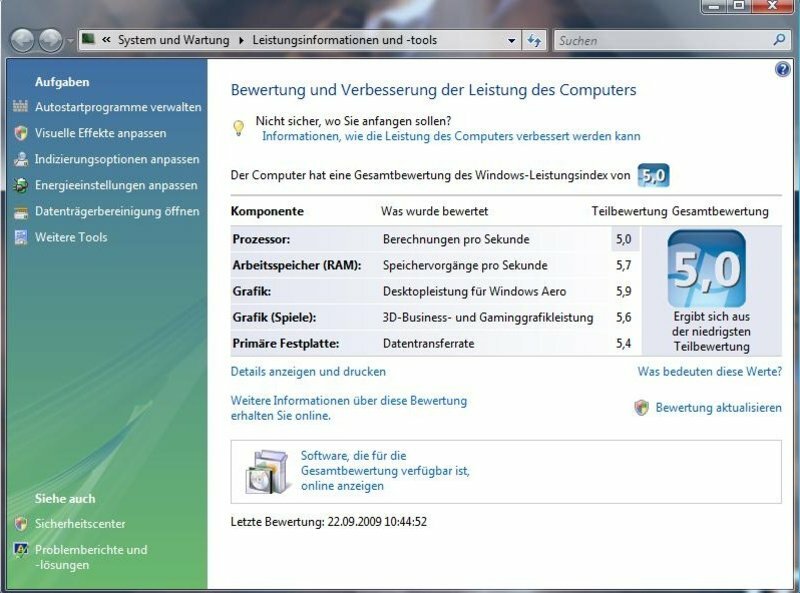 The Windows Vista performance index isn't very expressive on the whole, but can unveil weak points of the configuration. The CPU reached 5.0 points, the RAM 5.7 points, the graphic card 5.7 and 5.9 points (games) and the hard disk, conclusively, 5.4 points. Thus the CPU is unveiled as the "weakest link of the chain". 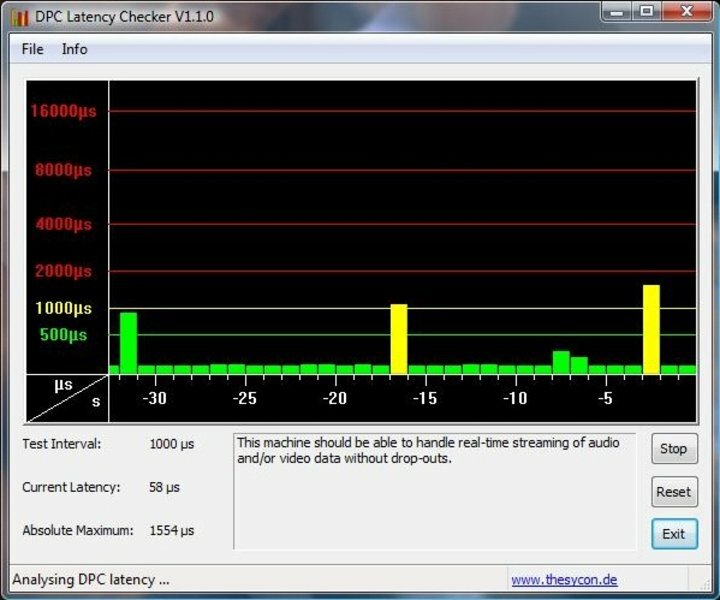 With help from the DPC Latency Checker tool, we also checked the latencies with windows. 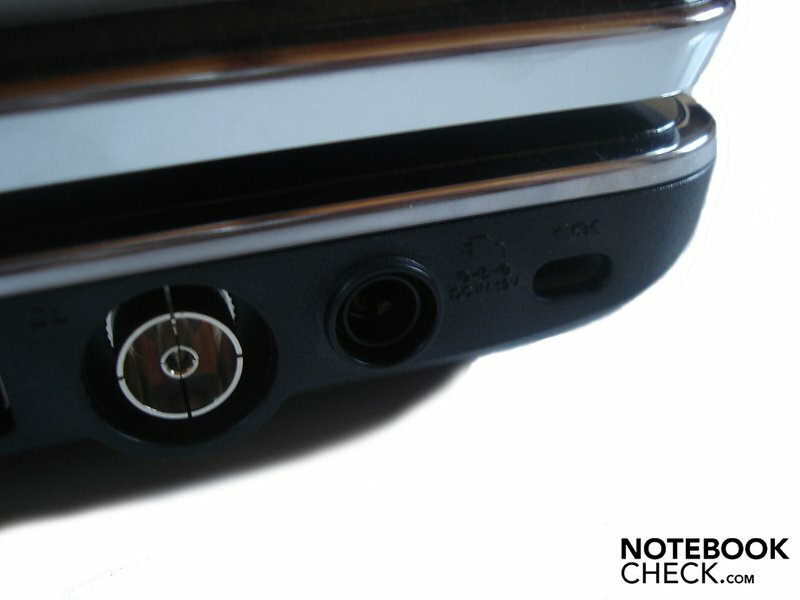 If these are too high, it can come to synchronization problems at connecting external devices (for example sound crackling with external sound cards). 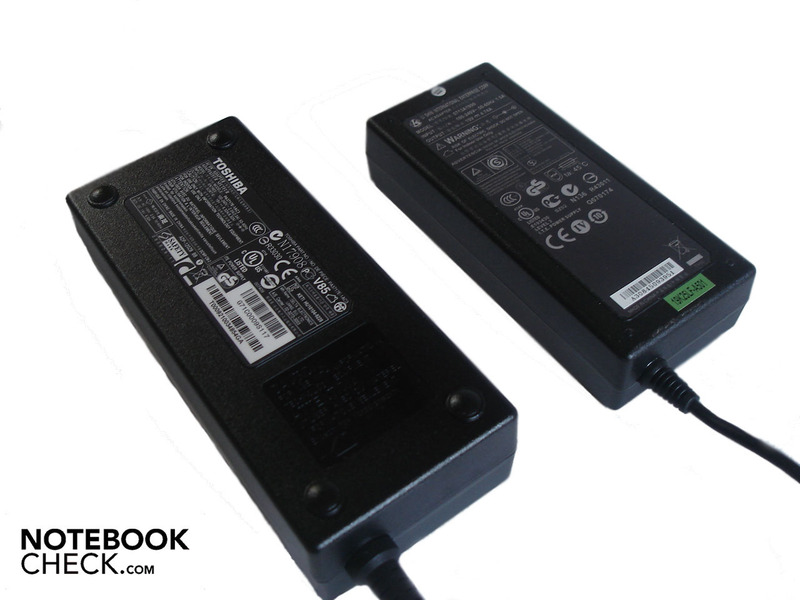 In this regard, the A500-15H doesn't show any weakness and always stays within a limit. The latency only rocketed to a still acceptable 1500µs every now and again. 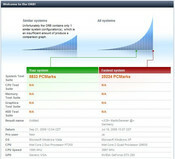 The application performance is overall good due to the Core 2 Duo P7350 and Radeon HD 4650. But now enough of synthetic benchmarks because the practical gaming performance of applications is what might really count for many users. We will progress chronologically and sort the tested games in view of the achieved refresh rate, whereas we will start with the fastest. If not otherwise noted, a resolution of 1280x1024 was used. Valve's zombie shooter isn't a problem for the A500-15H. Even very high details of 78.4 fps were effortlessly possible in a resolution of 1280x768. 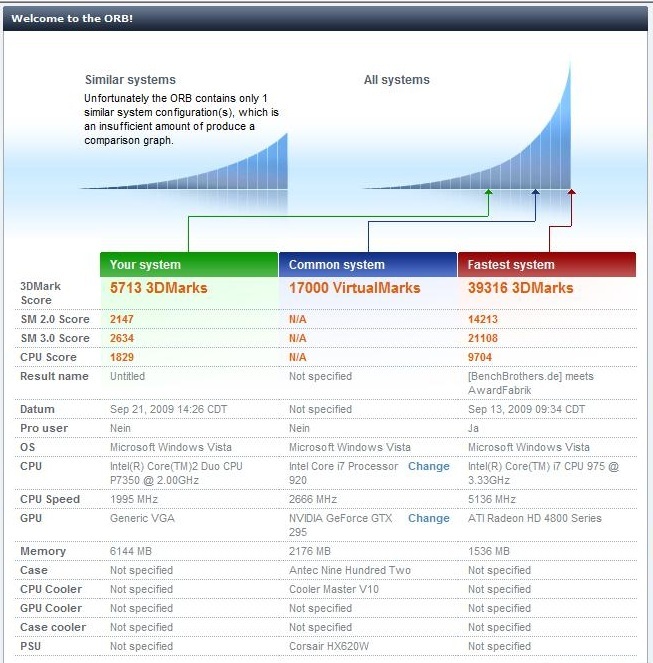 A GeForce GT 240M, in comparison, reaches 66 fps, a GeForce GTS 160M, in opposition, 103 fps. The very popular Call of Duty 4 isn't really a challenge for the Radeon HD 4650, either. 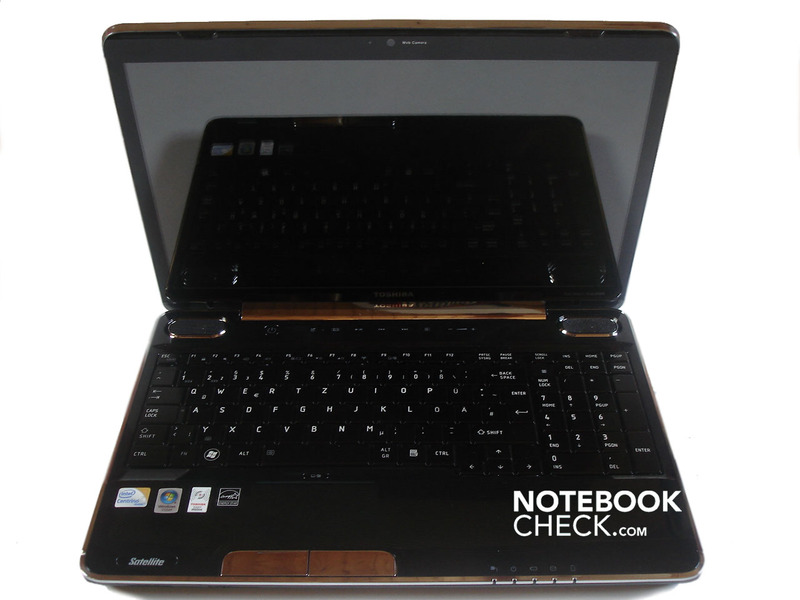 With high details, including 4xAA, the notebook achieved a constantly smooth 51.5 fps. In comparison, a GT 240M reaches 38 fps, a GTS 160M, in return, 75 fps. Monolith's horror-shooter will terrify the gamer at most. 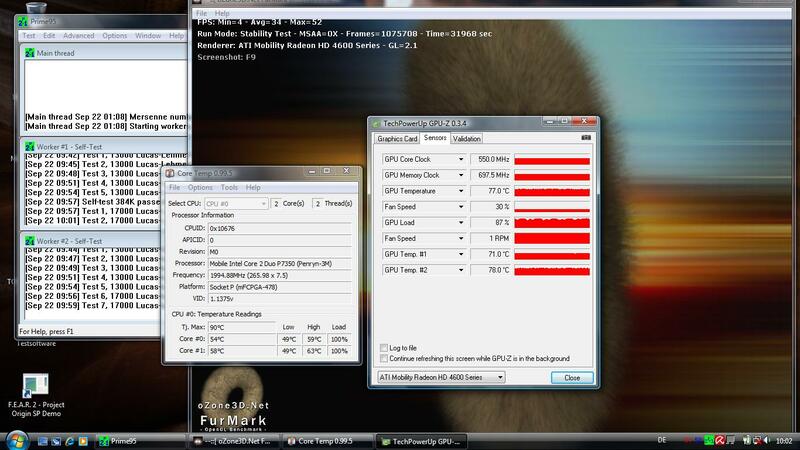 The A500-15H kept cool even in high details with 4xAA and provided for an average of 41.6 fps. A GT 240M is slightly slower with 39 fps, a GTS 160M is minimally faster with 43 fps. 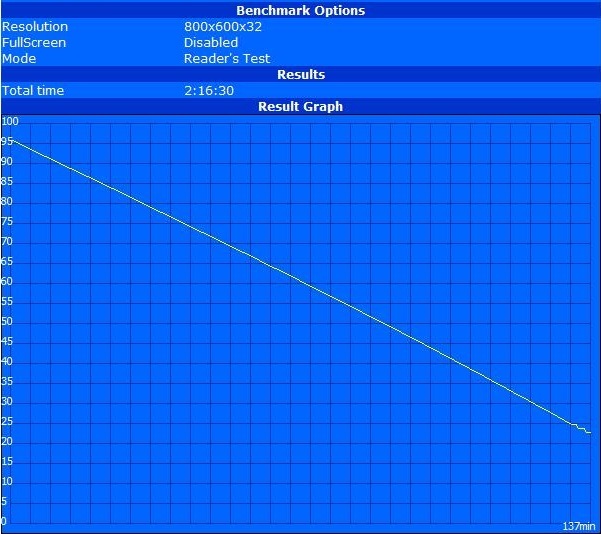 The HD 4650 supplied a quite smooth 36.6 fps in high details and 2xXMSAA in the race-game GRID. A GT 240M already has quite a harder time in this case with an average 30 fps. 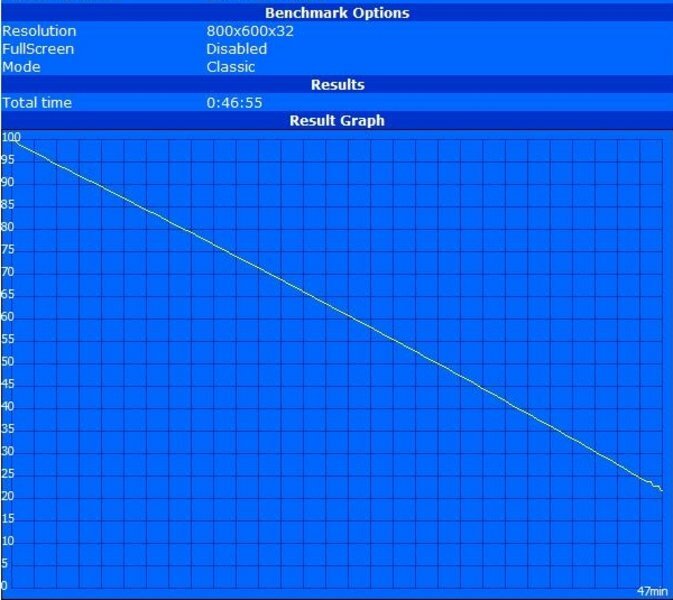 First Crysis starts showing the A500-15H its limits. Crysis studdered in the GPU run-through with 27.3 fps and in the CPU run-through with 21.6 fps in the integrated benchmark at high details and a resolution of 1024x768. But then again other graphic cards have their problems with it, too. Even the GTS 160M can't deliver any continuously smooth results with 34 fps in the GPU and 33 fps in the CPU run-through. A GT 240M computes even significantly slower with 21 fps in the GPU and 17 fps in the CPU run-through. 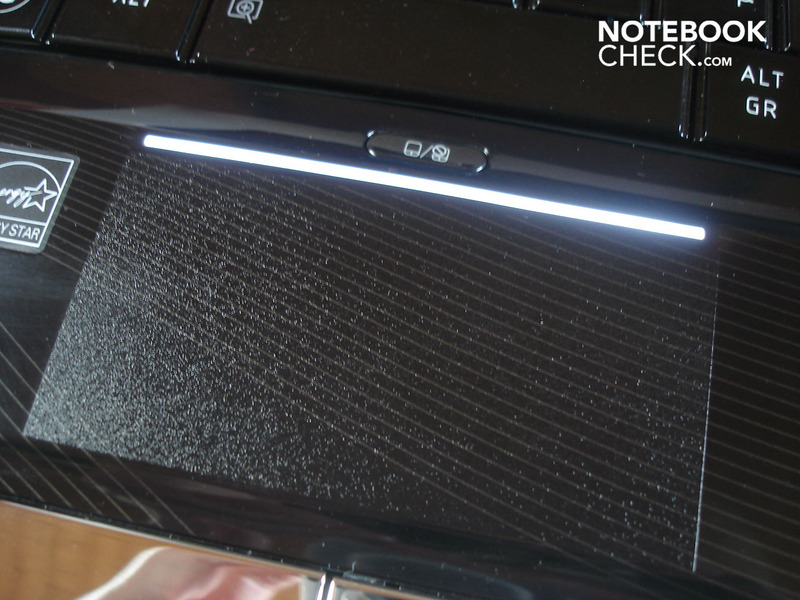 Furthermore, the DirectX 10 benchmark of Call of Juarez caused the notebook to sweat decently. 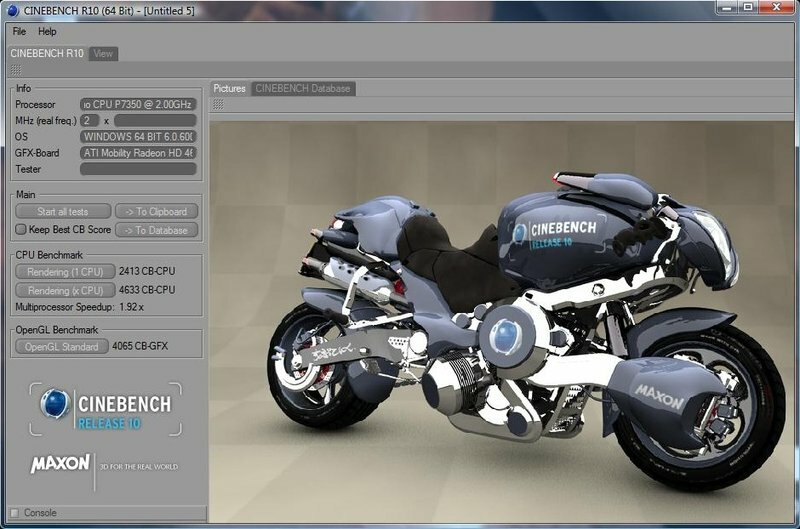 A smooth image buildup wasn't at all possible at a resolution of 1024x768, high details and 4xAA due to 22.7 fps. The graphic card merely achieved a meager 21.3 fps with very high details and 4xAF. Decreasing the settings, however, makes a pleasant gaming experience possible with an average of 32.5 fps. The GT 240M is on about the same level in high details and in return, the GTS 160M computes a bit faster with 34 fps. On the whole, the gaming performance verdict turns out to be positive. The majority of tested games could be played smoothly in the native resolution of 1366x768 in high and even very high details. 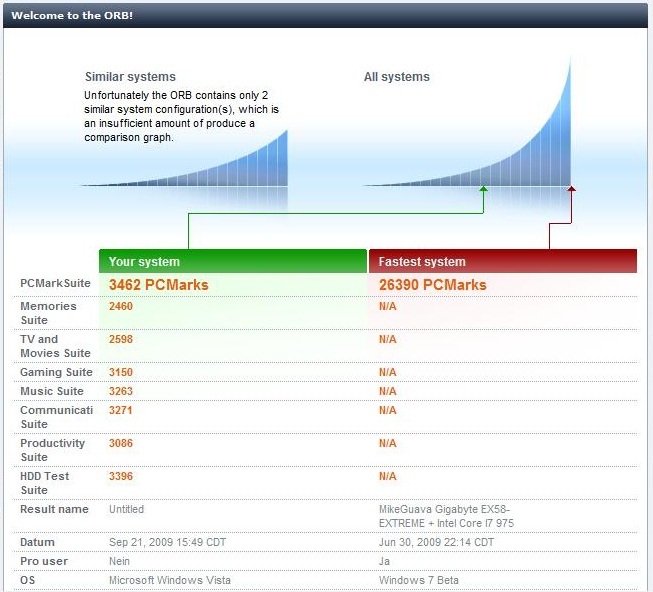 The details only had to be decreased to a medium level in very hardware devouring games like Crysis Comparing the Radeon HD 4650 to its competitor Nvidia shows that the GeForce GT 240M (which is often used in equally expensive notebooks) computes partly slower. The Radeon HD 4650 can't usually come close to the efficiency of the rather rarely used GeForce GTS 160M. 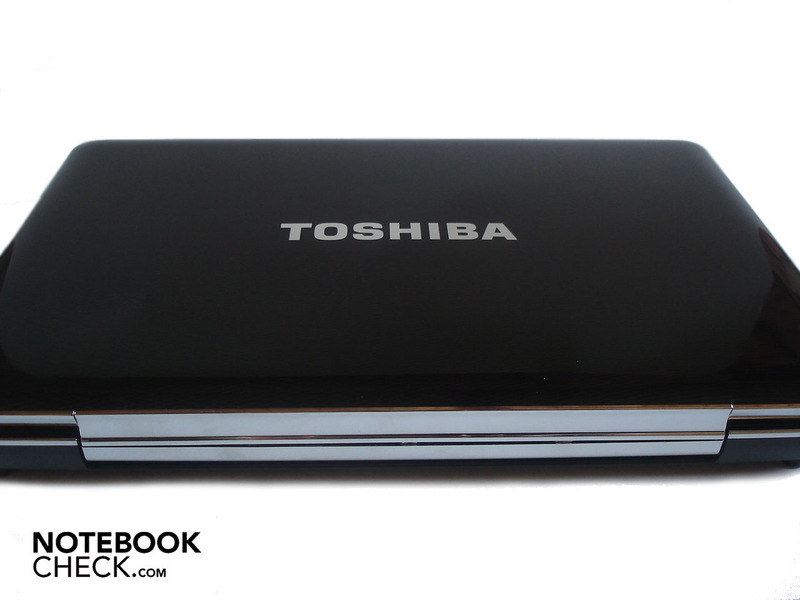 The high noise development is one of the biggest critique points in the Toshiba A500-15H. The fan already attracts considerable attention in idle mode with 33.8-34.6 dB(A). Additionally, the hard disk tends to sometimes click a bit, which doesn't make a high-end impression on the one side and on the other, proves to be very existent with 35.2 dB(A). The fan even ran between 39.2 and 44.2 dB(A) under load and gets almost unpleasant in doing so. The chic slot-in drive then takes the proverbial cake. 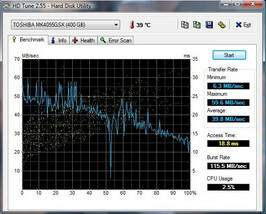 DVD rendering expresses itself in 37.2 dB(A), whilst the drive already roars along unbearably to a part at data access. 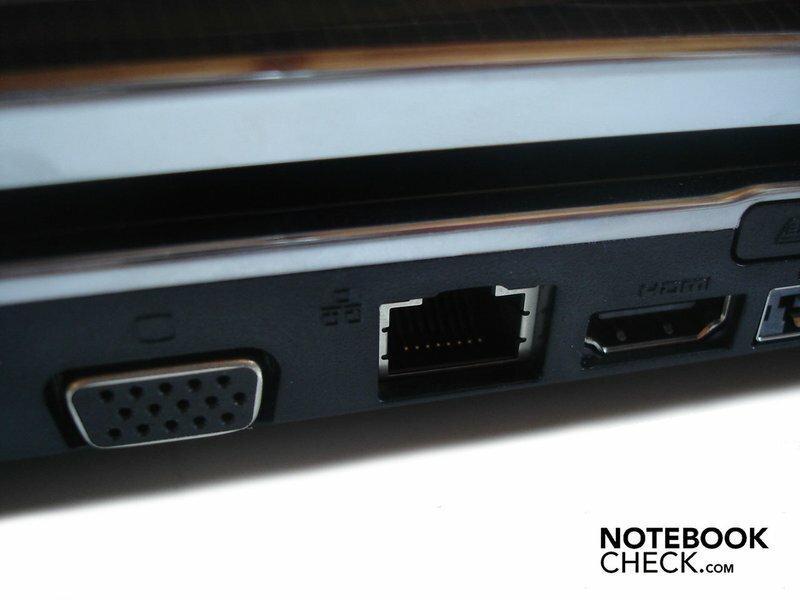 Therefore, you should keep a certain distance to the notebook in order to, for instance, enjoy a movie accordingly without permanently being disturbed by the loud drive noise. Our evaluations were made at a distance of 15 cm. As a compensation to the fairly high noise development, the temperatures remain mostly in an acceptable frame. The upper side reaches a maximum of 32.7°C and the bottom side 36.2°C at most in idle mode with maximum energy savings mechanisms. After an hour of use under full load, the temperature increases to a maximum of 35.9°C on the upper side and a maximum of 45.8°C on the bottom. Subjectively, the temperature is of course most noticeable at the palm rests. It heats up decently to a maximum of 35.4 °C under load, but is just still okay. The user will only notice the 45.8°c on the bottom if he uses the A500-15H on his lap. It does heat up quite unpleasantly after a while. Let's take a look under the notebook's hood. 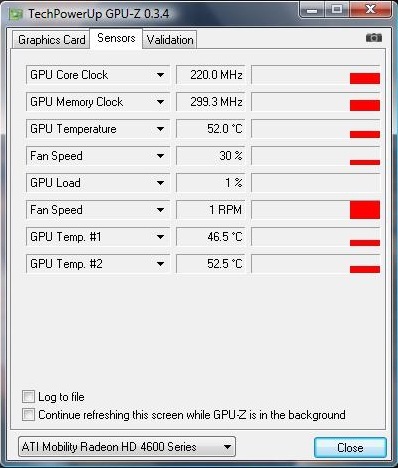 The graphic card always stays within a limit in both idle mode (approx. 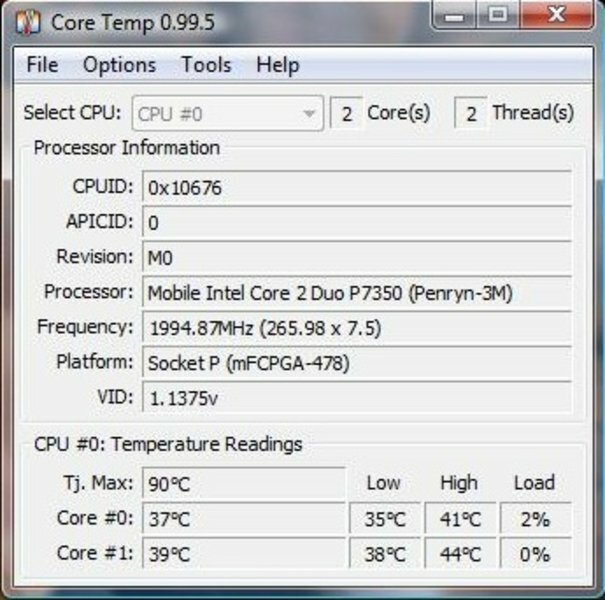 52°C) and under full load (around 83°C). There is nothing to criticize about the CPU, either. Thus, it reaches approx. 40°C in idle mode. Furthermore, it's about 60°C under full load. 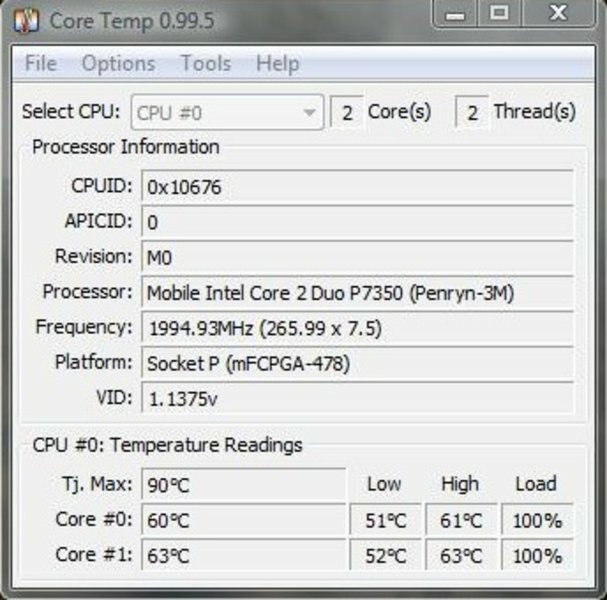 In order to examine the general stability and temperature development on the long term, we have put the A500-15H to a stress test and let it run in full load with Prime95 and Furmark for 12 hours. 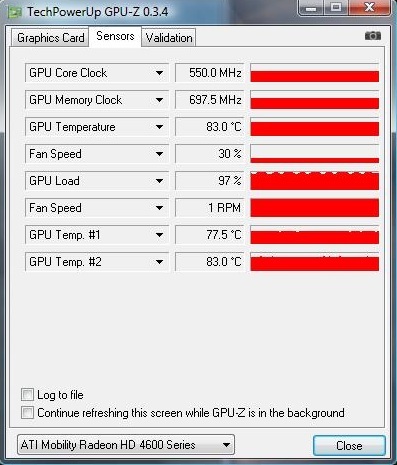 The GPU temperature established itself at about 77°C and the CPU temperature at about 56°C. We didn't record one single crash during our entire test. There wasn't even a sudden throttling of various components to be noted at any time. (+) In idle usage, the average temperature for the upper side is 30.1 °C / 86 F, compared to the device average of 30.9 °C / 88 F.
Aside from the attractive design, we were especially taken by the incredibly good loudspeakers. All sound ranges were played fairly clear and well-balanced, whereby it can be said that the bass could have used a bit more volume and the trebles tend to fray a bit in extreme cases. 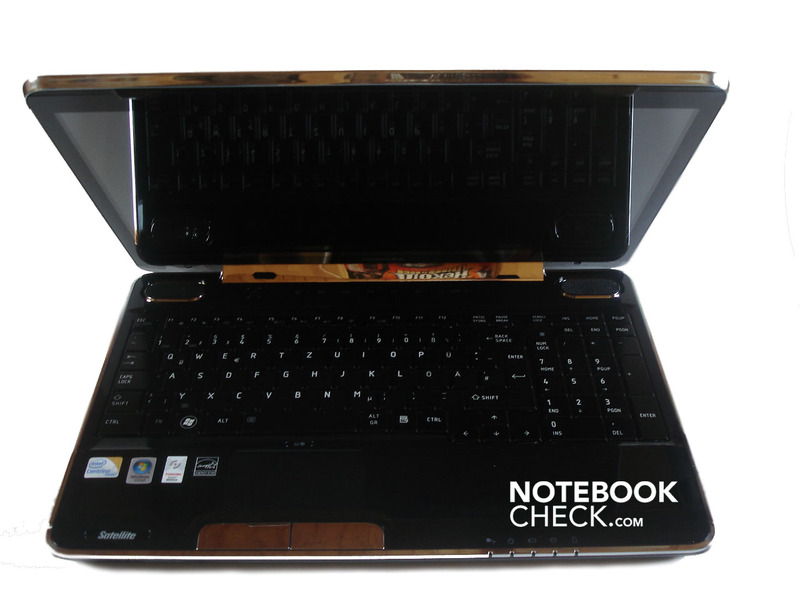 In comparison to other notebooks, both large and very visible loudspeakers from Harman/Kardon exceed the competitors by far, though. 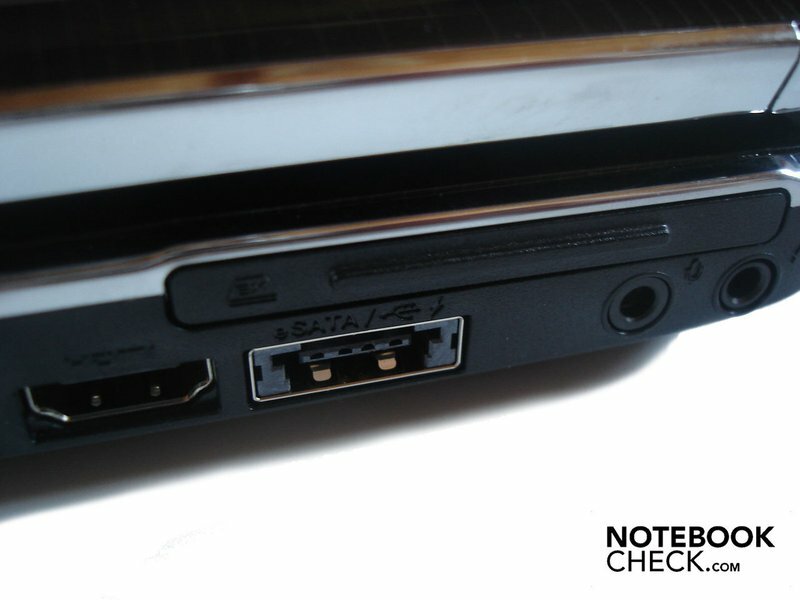 This tester has never before had the pleasure of hearing such a convincing sound from a notebook. If it weren't for the display's disappointing image quality and the too high noise development, the A500-15H could almost be perfectly suitable for a cultivated movie evening. 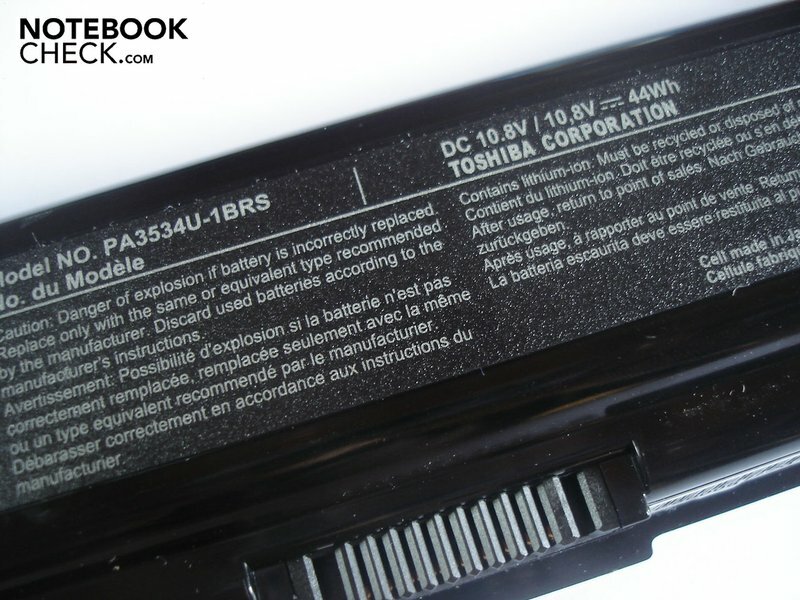 Toshiba uses a six cell lithium Ion model with 44 WH for a battery. Unfortunately, in the run of our measurement it turned out the battery is far too weak for the components' requirements. The notebook merely survived for a disappointing 47 minutes under full load and maximum brightness (BatteryEater's Classic Test). The result wasn't much better at DVD rendering with maximum brightness. Only a meager one hour and 15 minutes was possible remote from the mains. Such a performance is too little, in particular, for a multimedia notebook. The notebook had to go back to the mains already after 1 hour and 35 minutes at WLAN surfing, maximum brightness and medium energy savings settings. The battery life is primarily at least halfway reasonable in idle mode with minimum brightness and maximum energy saving mechanisms with 2 hours and 17 minutes. Of course, we have taken a closer look at the power consumption. 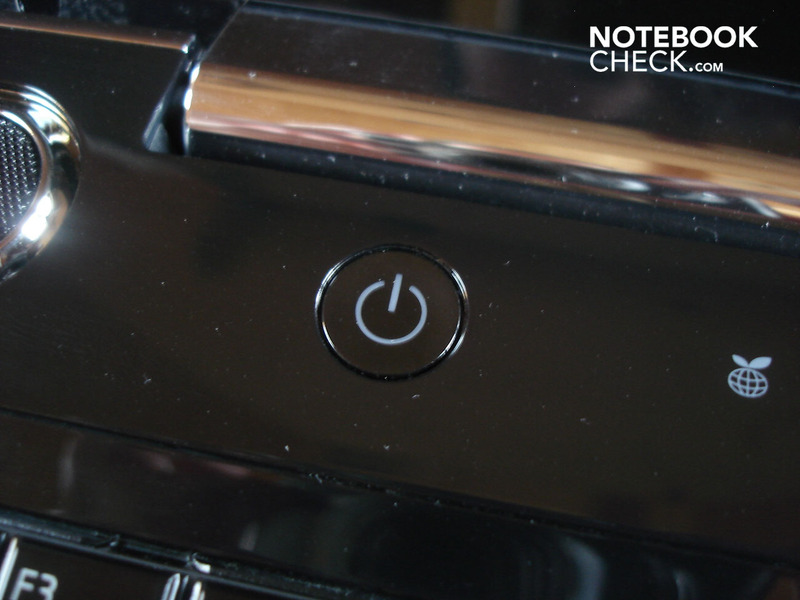 The notebook allows itself between 25.1 and 41.4 watts in idle mode. In opposition, it's between 55.6 and 77.4 watts under load. The power consumption decreases to 0.3 watts in a deactivated state and to 0.6 watts in stand-by mode, whereas the latter values have turned out a bit too high. 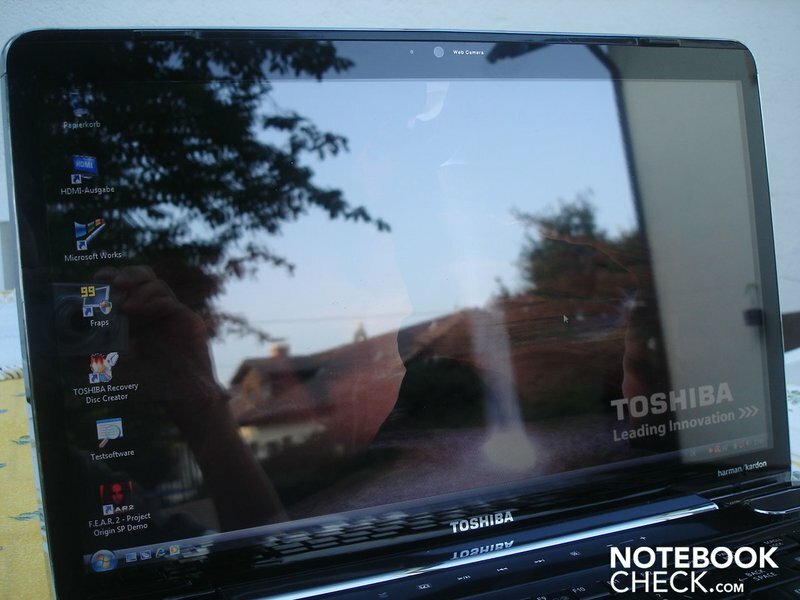 The Toshiba A500-15H makes a very good first impression. The design is attractive, the case is stable, the workmanship is almost flawless and the applied materials make a high-quality impression. Furthermore, the manifold of connectivity knows how to attract attention. Additionally, the included software with its numerous interesting programs and functions, as well as the supply with a remote control turns out unusually opulent. Too opulent, as the notebook is a lame duck in its state of delivery. 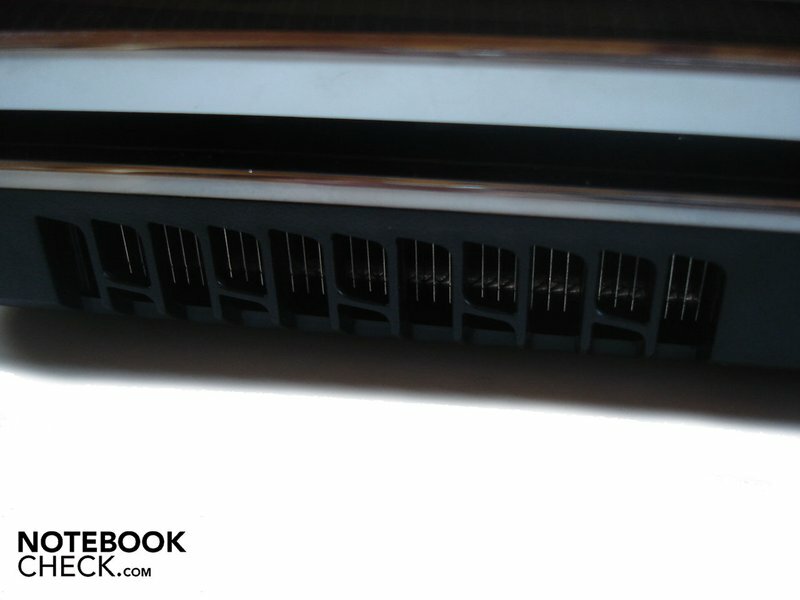 After cleaning the system from its very disturbing ballast, the good application, and especially the gaming performance, are convincing due to the Radeon HD 4650. 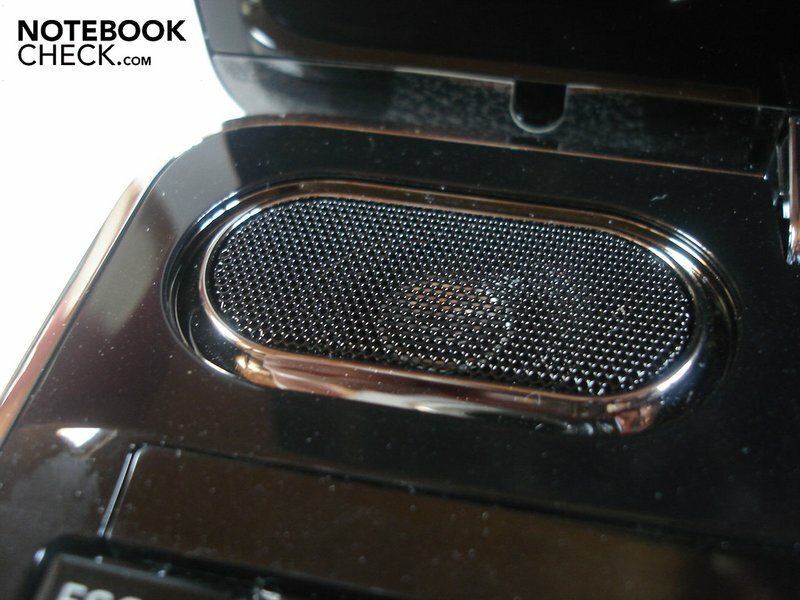 We were also surprised by the over-averagely good sound, which doesn't show any weakness at music, gaming or movies. However, the A500-15H isn't unfettered from critique points. Thus, the noise development is already high in stand-by. The fan then turns up even more under load, whereas the disagreeably loud drive tops it even more. 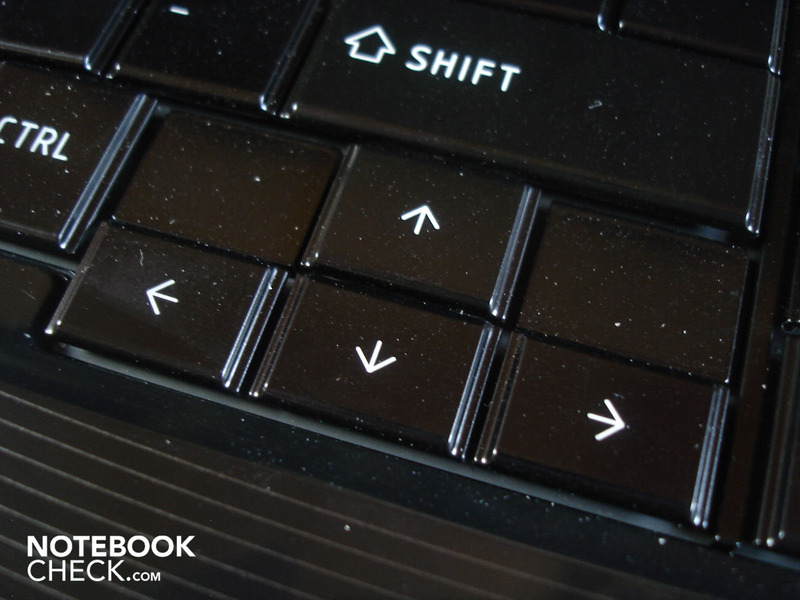 The touch-sensitive hotkeys are peeving with their inadequate pressure point and the keyboard that deflects obviously to a part. Above this, especially in view of the entertainment aspect, the meager battery life and the mediocre image quality turns out to be insufficient. 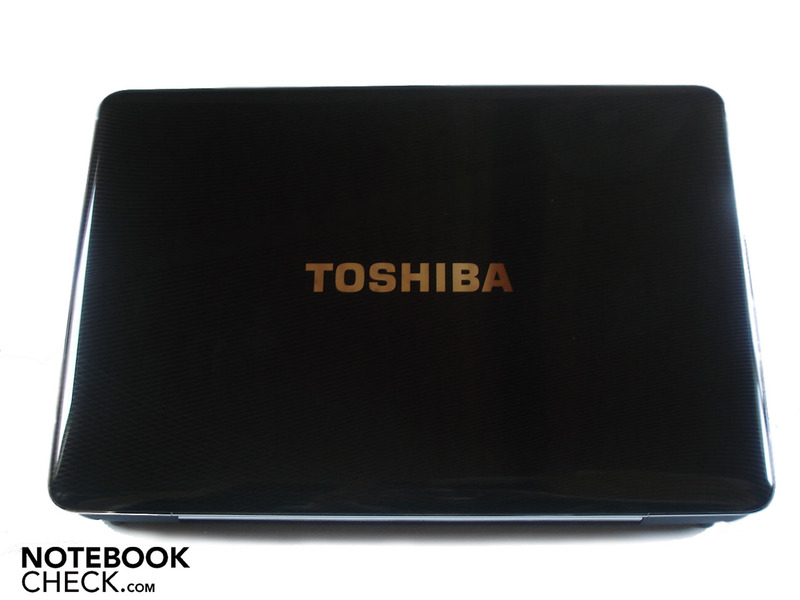 Overall, the Toshiba A500-15H is a felicitous mixture of multimedia and gaming notebook. Those who are looking for such a combination, can take hold of it. Those who mainly put value on the entertainment aspect should be fairly noise resistant on the one side and on the other consider the expected display quality. The attractive design with its stylish line management. The good workmanship and stability of the case and the quantity of connections, too. And last, but not least the extensive software equipment and a remote control as supply. A considerably better display quality. The contrast is too low, and in return, the black value too high. The image makes a pallid and colorless impression. Furthermore, the battery life is very disappointing and the fan as well as the drive turns up extremely, especially under load. The incredibly good loudspeakers. Seldomly, do you get to hear such a superior sound in notebooks. Furthermore, the given gaming performance convinces completely. 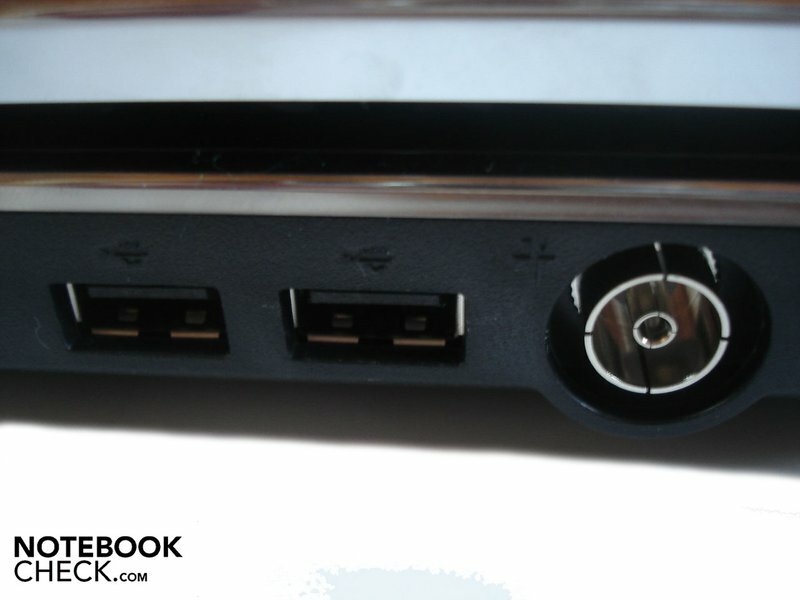 Other efficient notebooks orientated on gaming at a moderate price, such as the MSI GX623 or the MSI GT628. 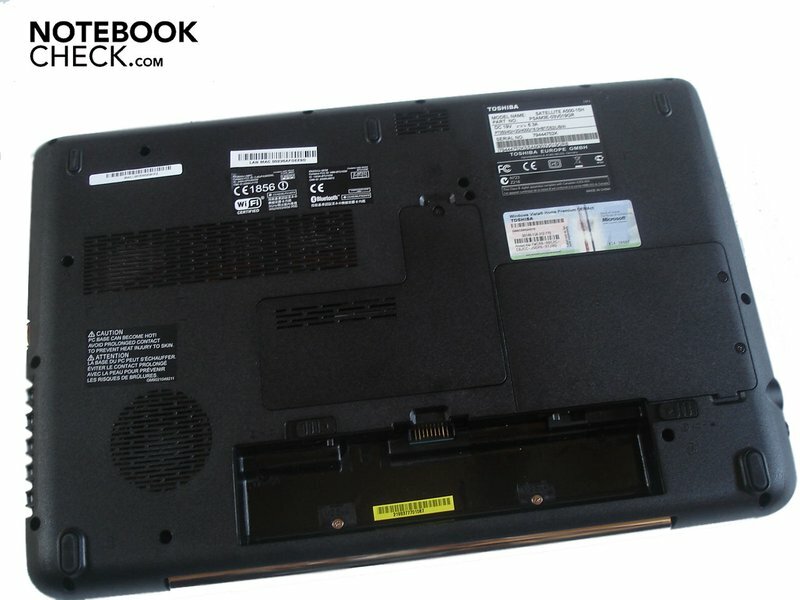 Other multimedia and/or all-round notebooks like the Dell XPS 16, the Samsung R522-Aura T6400 Edira, the Acer 7738G, the Packard Bell TJ65, or the Asus N51V.